I know what you’re thinking. Why do I need a recipe for avocado toast, it’s just mashed avocado and bread, right? Wrong. Well, kind of. Sure, you could just throw some avocado on a piece of white bread and call it a day and it would be pretty good. 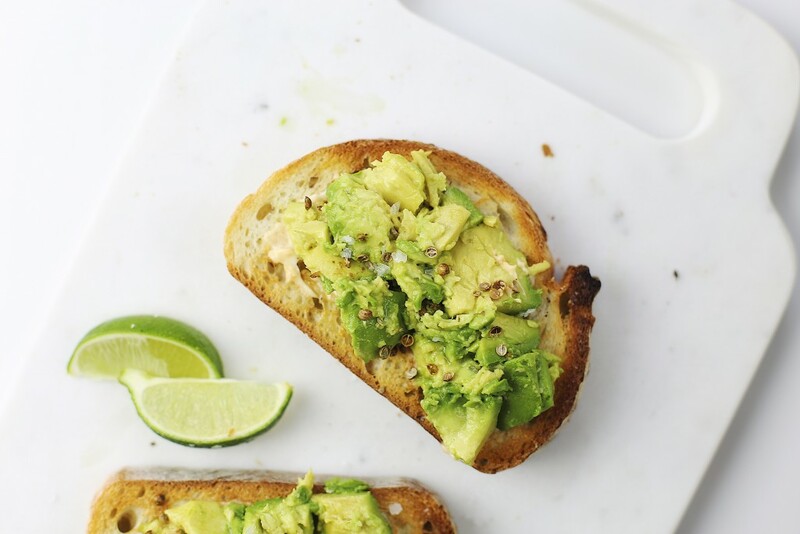 But when you’re feeling something a bit more elevated, this avocado toast recipe is perfect. 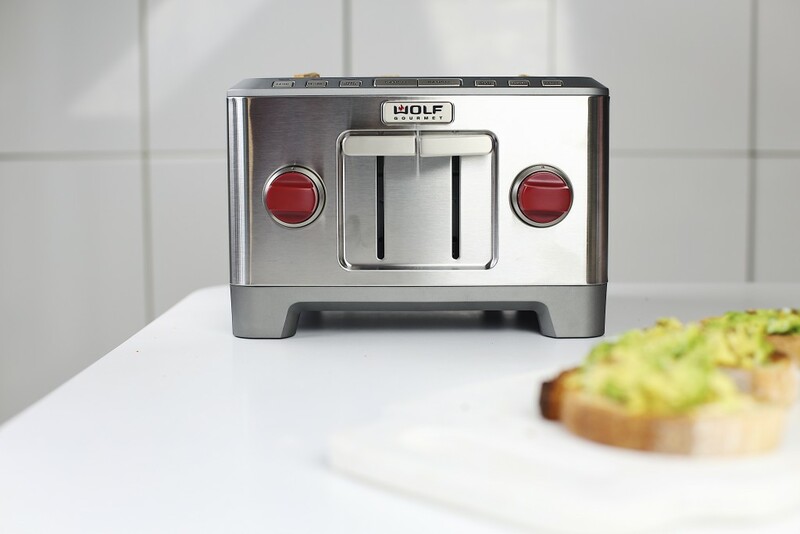 For this recipe I’ve teamed up with Wolf Gourmet to highlight their 4-slice toaster. For years, I’ve been using a toaster oven at home and every time I use it, I remember how much I hate it. It takes forever to toast bread and doesn’t even do a particularly good job. So I was pretty excited to finally have a reason to make the switch to a pop up toaster and the Wolf Gourmet 4-slice didn’t disappoint. 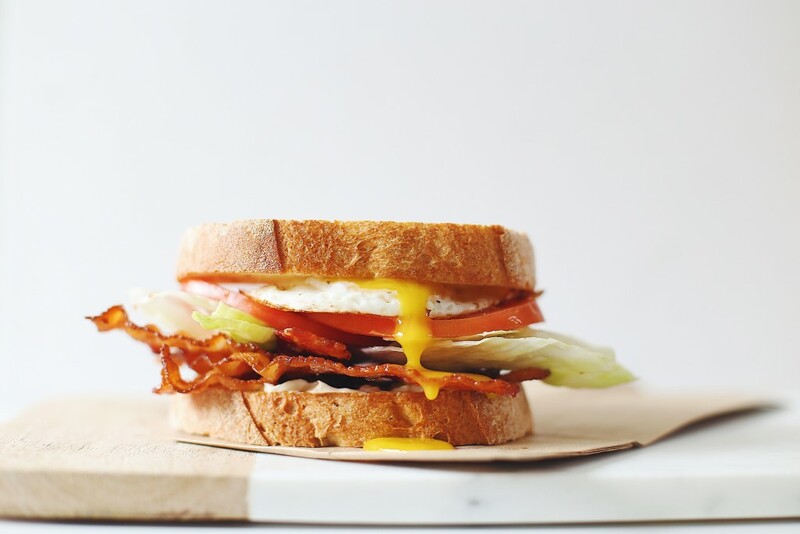 After using the Wolf Gourmet 4-slice toaster for this recipe, I’m totally sold on it and will definitely not be going back to the toaster over. It was quick, gave me perfectly even browning, and it’s also pretty easy on the eyes. What else could you ask for in a toaster really? You can purchase the toaster at Williams-Sonoma. Alright, on to the avocado toast. First let me say that if you think avocado toast is just avocado toast, you haven’t experienced enough of it. Like I said earlier, there is nothing wrong with a basic avocado toast. But for when you need something a little extra, this is the avocado toast for you. A few things set this apart. The first thing is the bread. You want a crusty bread. It doesn’t really matter but something with a bit of a chew. French bread, baguette, or sourdough would work perfect. You want to toast it until golden brown. I used level 6 on this toaster. The next thing that sets this apart is a bit of garlic. When the bread comes out of the toaster, you want to rub each piece with a clove of garlic. It’s an easy thing to do, but it really makes a difference. Chipotle mayo is what takes this avocado toast to the next level. Avocado is already creamy on its own so the addition of chipotle mayo is really a luxurious addition. The last unique thing about this is the toasted coriander. I love the flavor of coriander seed, especially when it’s toasted. I find that it meshes perfect with the avocado, chipotle, and lime in this case. When it comes to the actual smashing of the avocado, there are a few routes you can take. You can mash it all up in a bowl and then spread it on the bread. But I find that’s a bit more like guac. 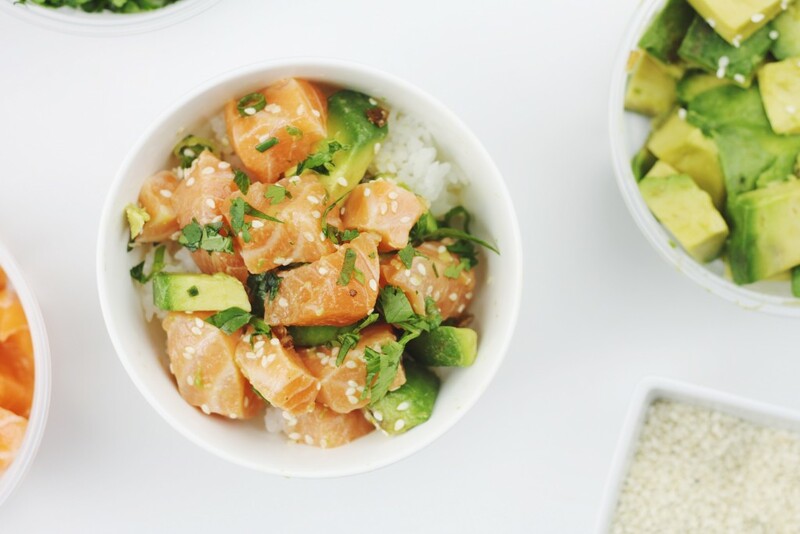 The avocados I had for this recipe were so perfect I didn’t want to completely smash them. Instead, I cubed them and then gave them a light press with a fork in order to get a bit more texture out of the avocados. That’s really just a preference though. You could smash the avocado, more, less, or not at all depending on your mood. If you’re wondering why there are only 3 toasts in the pictures, it’s because I couldn’t resist and ate one before I could take pictures. Toast your bread until perfectly golden brown and then rub each piece with the clove of garlic. 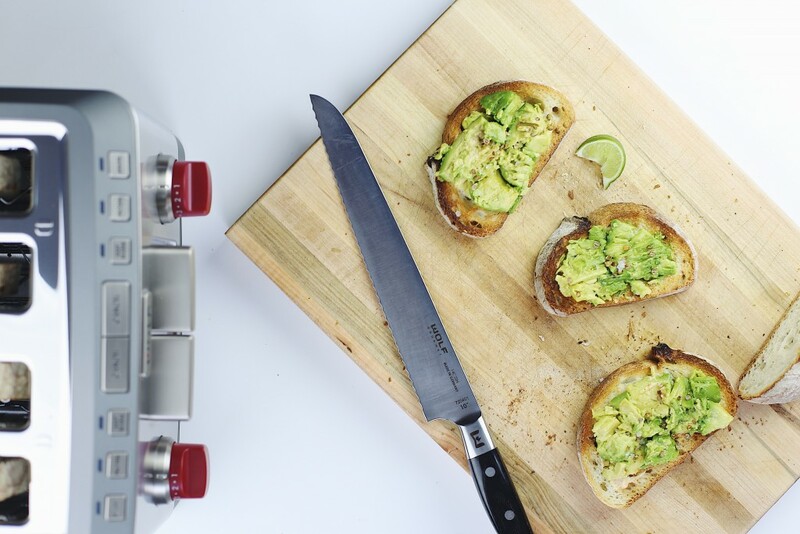 While the bread is toasting, halve the avocados and carefully remove the pits using a sharp knife. Score the avocado halves in a cross-hatch pattern and then using a spoon, slide between the flesh and skin to get out the cubes. Toast the coriander seed in a dry pan over medium heat until fragrant moving them around every 30 seconds or so. Allow them to slightly cool, then crush using the bottom of a heavy pan or pestle and mortar. Set aside for now. Spread about 1 tbsp of chipotle mayo on each piece of toast leaving a bit of the bread exposed around the edges. 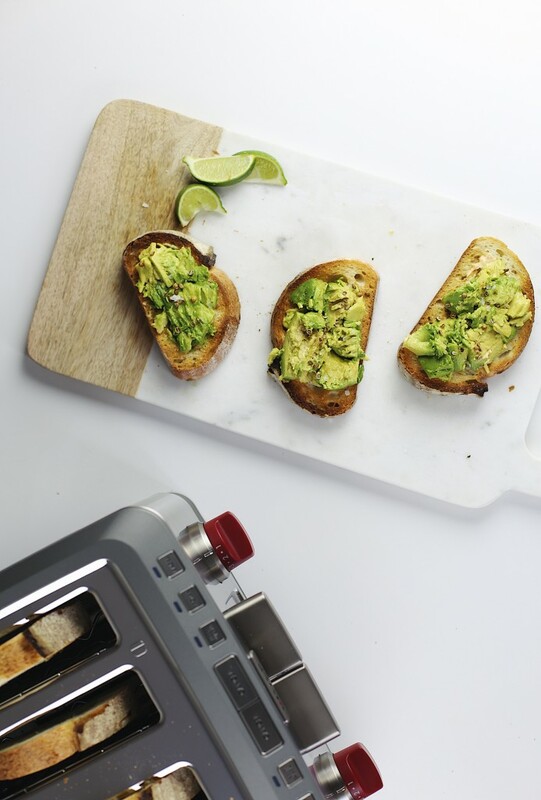 Top each piece of toast with 1/2 an avocado (cubed) and then lightly press them down using a fork. Sprinkle the coriander amongst the toast and then add a pinch of salt to each toast as well. Serve with lime for squeezing. 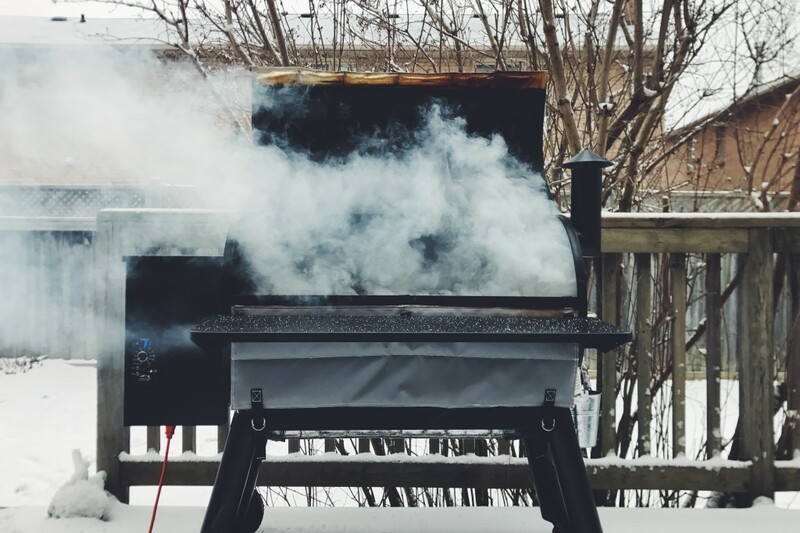 Summer is here and that means it’s officially grilling season. It’s not that I don’t grill during the rest of the year, in fact, I’m content with barbecuing in a blizzard. But now that we’re finally getting some good weather, I’m basically doing all my cooking outdoors. I’ll grill anytime, and I’ll grill anything. For this post, I’ve partnered with HomeSense. HomeSense is my go to spot for all my BBQ entertaining essentials. They’ve got tons of outdoor dishes, glasses, and all the accessories you could ever need, everything is at a great price too. With Father’s Day around the corner, It’s the perfect spot to find gifts as well. Click here to find your local HomeSense. 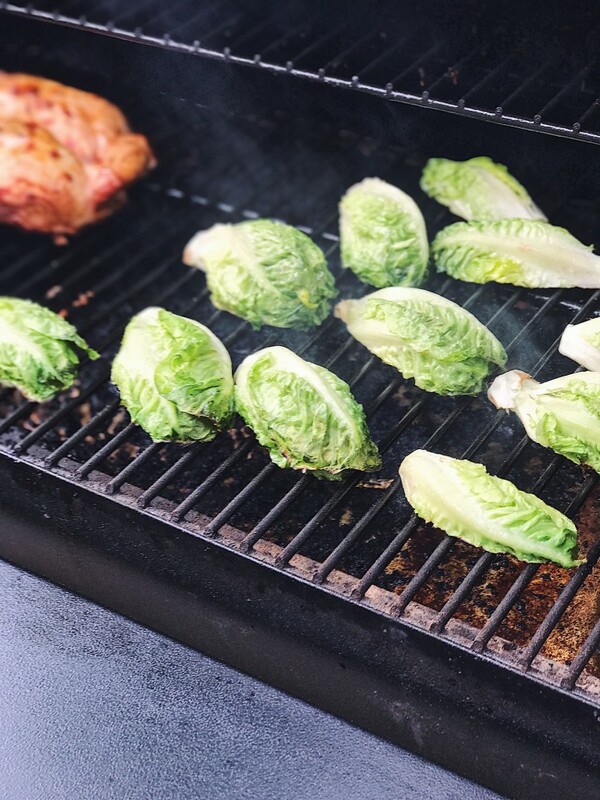 Homesense provided me with some great grilling accessories for this post so in addition to the recipe, I’m going to share a few tips and accessories that I really loved. Everybody likes to grill burgers, steaks, hotdogs, and chicken, but there are so many other fun things that taste great when grilled. I’m a big fan of wedge salad, especially during the summer. It’s something I make all the time. 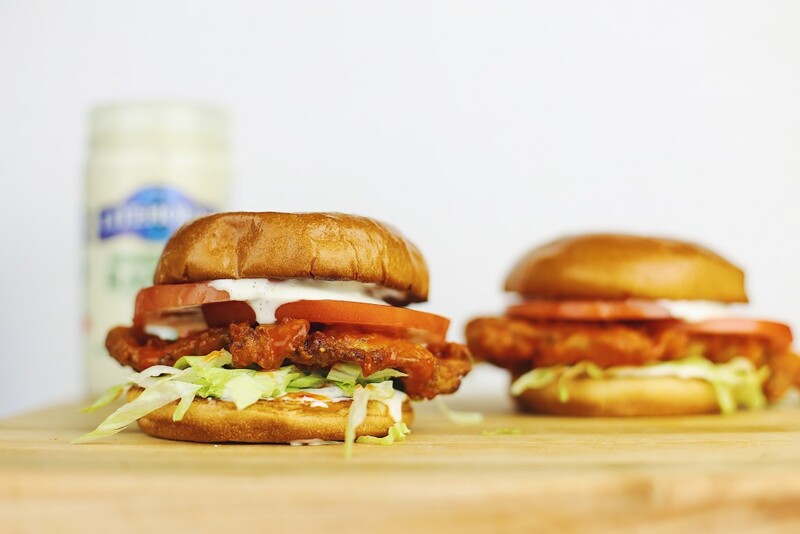 All you need is a crisp green like romaine, iceberg lettuce, or in this case baby gem, and a creamy ranch. You could throw that on a plate and call it a day. Or, you could step up your game and grill your wedge salad. It’s super easy and also a fun way to change things up from the usual routine. Grilling baby gem takes no time at all. A minute on a hot grill is all you need to get a bit of a char and tons of smokey flavour. 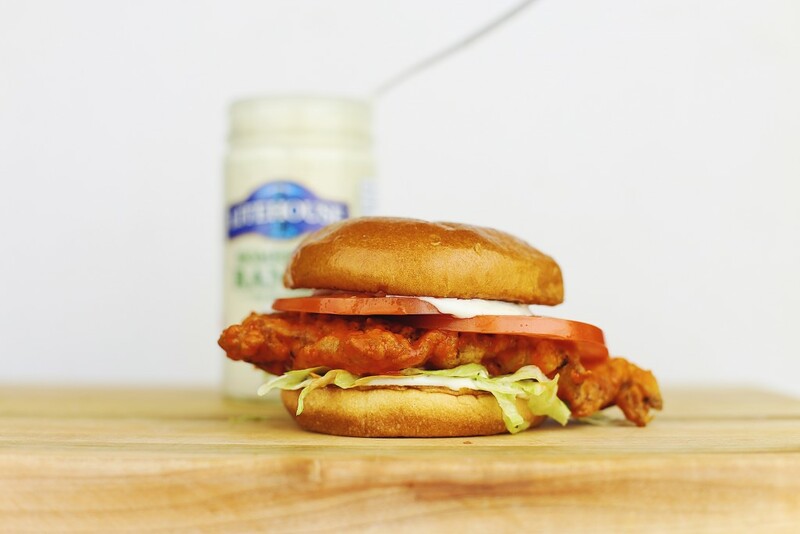 The Jalapeño buttermilk ranch also goes perfect with the grilled greens. I take all the seeds out so its not too spicy but you definitely still get a bit of heat. 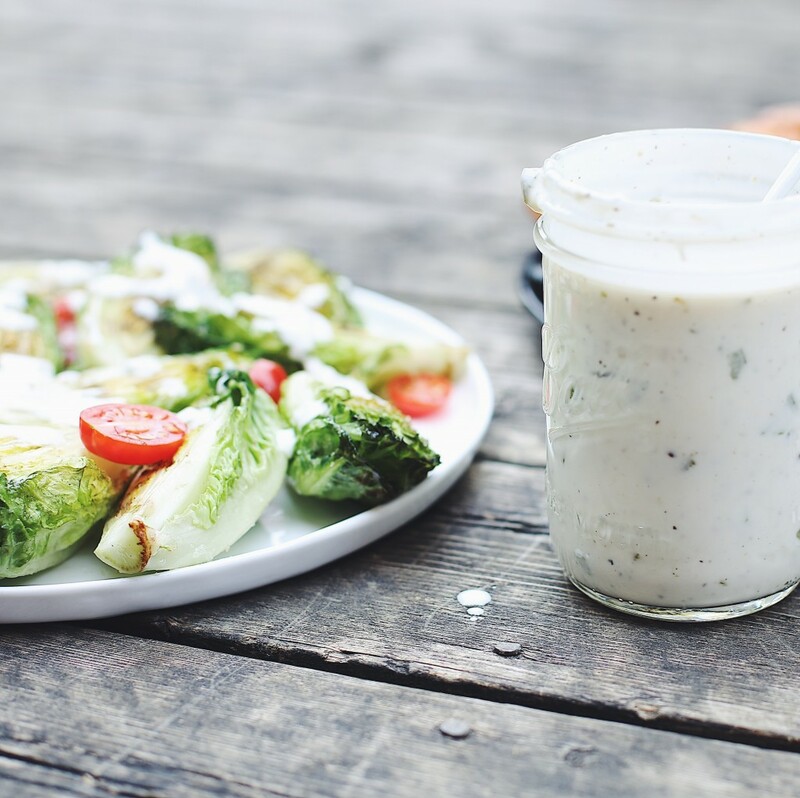 If you don’t typically make your own ranch dressings, you should. You only need a few ingredients and it’s so much better than store bought. You can change it up really easily by adding herbs or different spices. I often add dill and parsley to this dressing as well. I also like that you can completely control the consistency of the dressing. Just add a bit more buttermilk to thin it out or add a little more yogurt if you prefer a thicker dressing. I wanted to keep this salad relatively simple so I just added a handful of cherry tomatoes. But you could make things a bit more interesting by adding different veggies or even fruit. Cucumber and onion are always safe bets but some sort of citrus like orange or grapefruit would also be a fun addition. Same goes for cheese. I often add feta or blue cheese to my wedge salads. Before I get to the recipe, I want to share a few of the grilling accessories that I got from HomeSense. First is this burger mold. 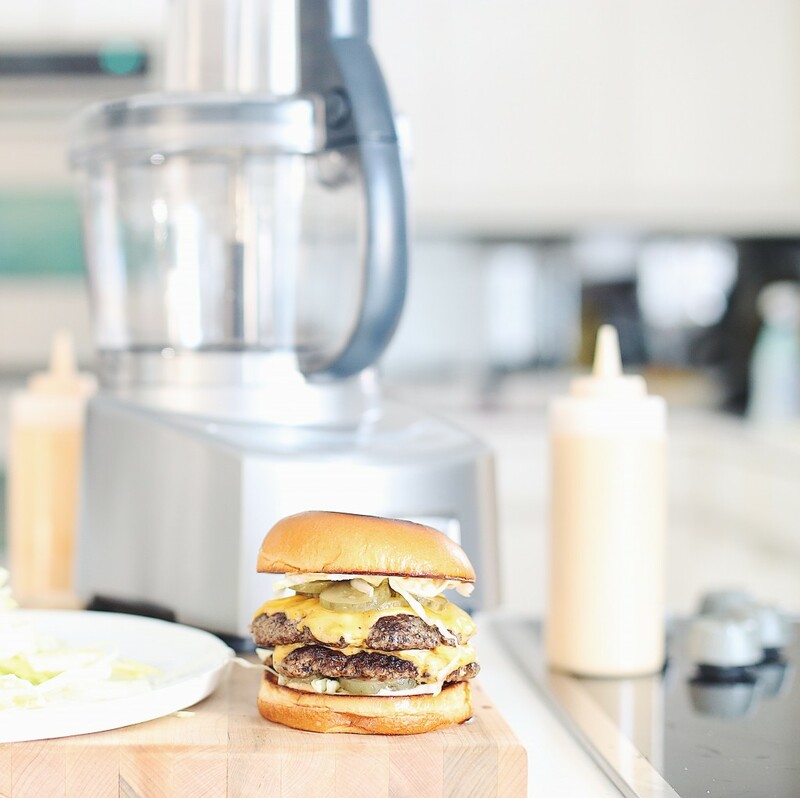 I typically don’t use burger molds because I find they over compress the burger and make it tough. That’s not an issue with this one though, since the meat doesn’t get squished down. You just gently fill it up, and then cover it with the lid. 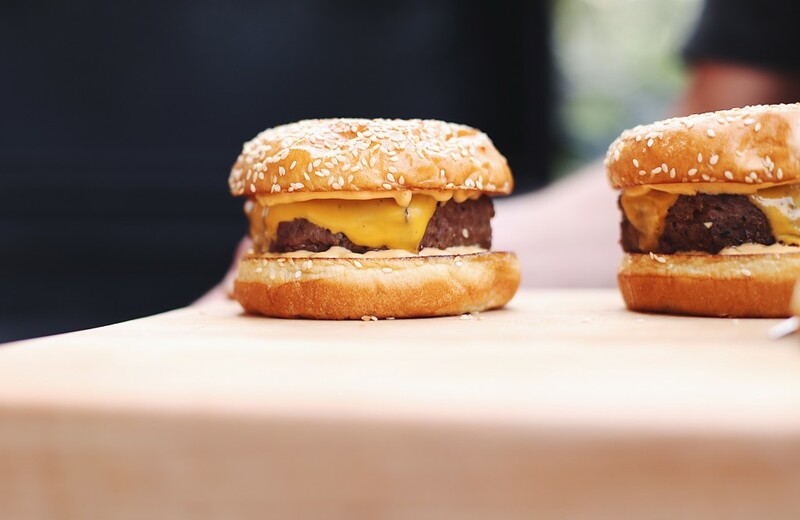 I always like to have a batch of burgers in the freezer and this mold is perfect for that. The hexagon shape is also a fun change. Another great accessory are these mini thermometers. I always like to use thermometers when I’m grilling whole chickens. For me, it’s the best way to tell when it’s done. This set has 4 thermometers so they also are perfect for cooking multiple steaks and ensuring each one is cooked perfectly. The last accessory that I want to share is this BBQ wok. I love these for doing small veggies on the grill that could easily fall through the grates. It’s perfect for doing onions to go along with your burger. All the other accessories in this post are also from HomeSense, so if you see anything you like, you know where to get it. Cut each baby gem in half ensuring to keep the base intact. Toss them in a bowl with olive oil and salt and then grill cut side down for about 1 minute. You just want a bit of colour on them. 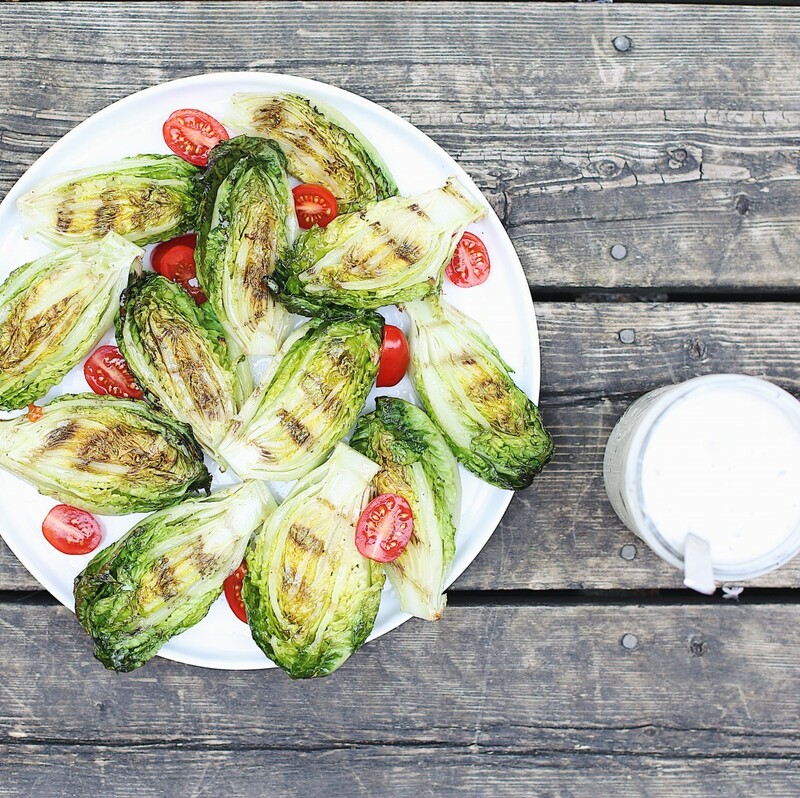 Remove the lettuce from the grill and arrange on a serving plate with the halved tomatoes. 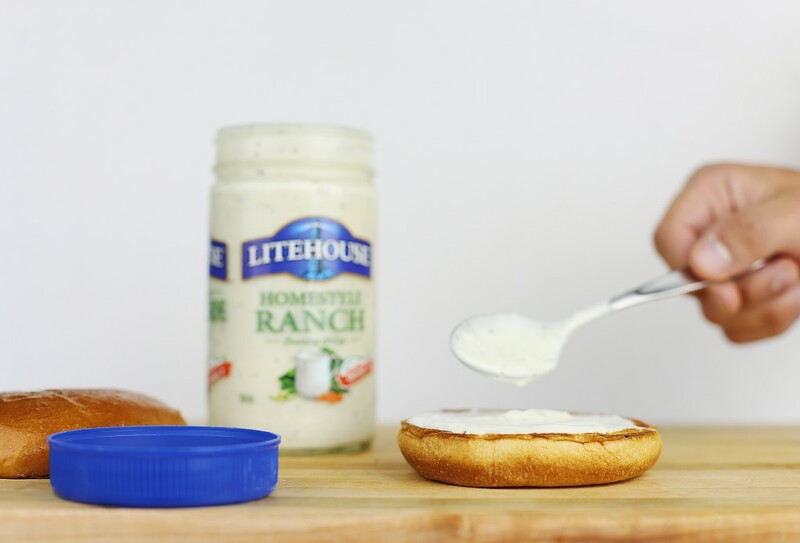 Drizzle the salad with the ranch and serve extra dressing on the side. When I think of an exciting dinner, chicken is not usually the first thing to pop into my head. I typically think of chicken as boring and uninspired. Probably because growing up, I had chicken breast for dinner several times a week. But chicken doesn’t have to be boring. It’s a great protein and there are so many things you can do with it to make it something that you actually crave. In the summer, I love to grill whole chickens. 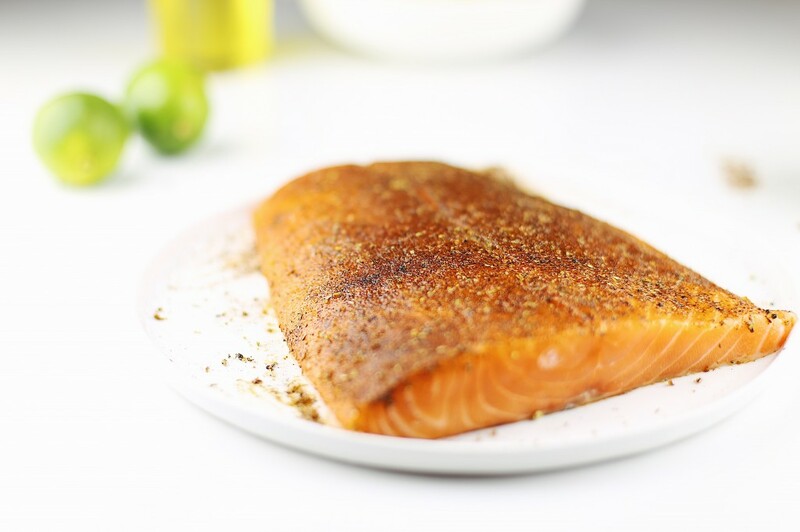 My favorite way to do it is by flattening it, and giving it a flavorful spice rub. 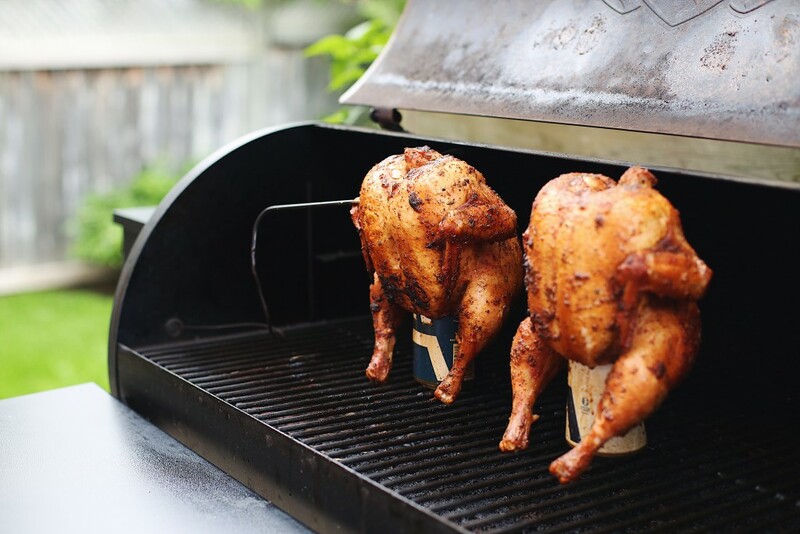 It’s also fun to make beer can chicken on the Grill. Smoking chicken is something that I’ve been wanting to try for a while now and since I’ve got my Traeger, I can make it whenever I want! 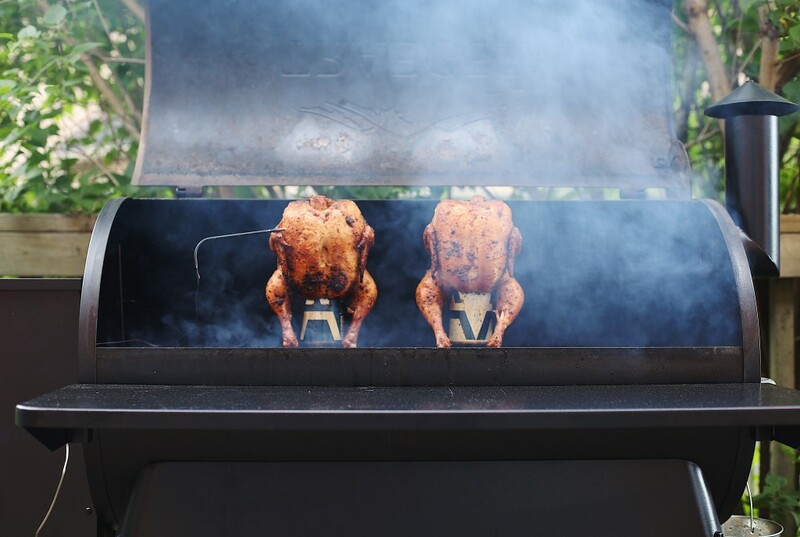 Smoking is actually a really simple way to prepare chicken. It takes a bit longer than just grilling it, but I love the smoky flavor you get by cooking it low and slow. If you’re anything like me, you probably agree that the best part of grilling chicken is the crispy skin. 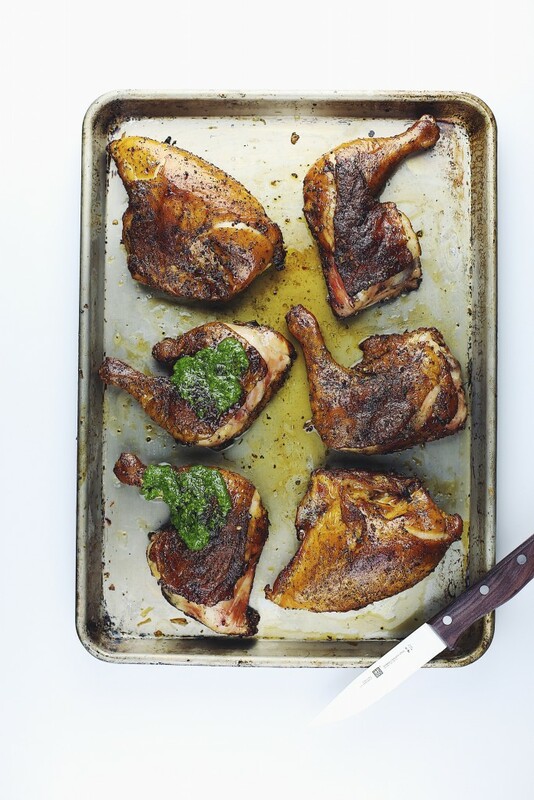 If you just smoke the chicken over low heat, you won’t really get a crispy skin, but by cranking up the Traeger to high, you can get a super crispy skin, just take a look at these pictures! 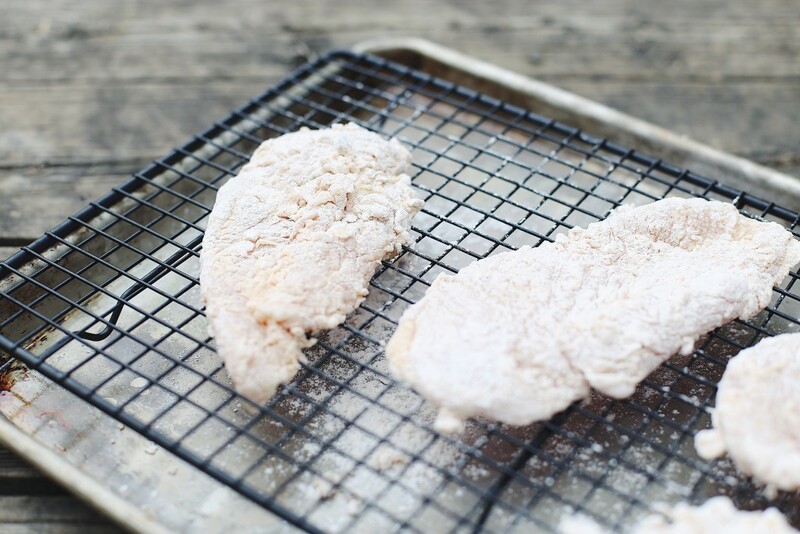 One of the biggest issues people tend to have when cooking chicken is drying it out. I have a few tips to ensure you end up with a juicy bird. Firstly, brine the chicken. You can either do a wet brine or a dry brine. I tend to prefer dry brining my chicken. This basically consists of rubbing the chicken with salt and allowing it to rest in the fridge. It’s that simple. And if you are following this recipe and making a dry rub, you can put the whole rub on which will essentially act as a brine because of the salt content in it. 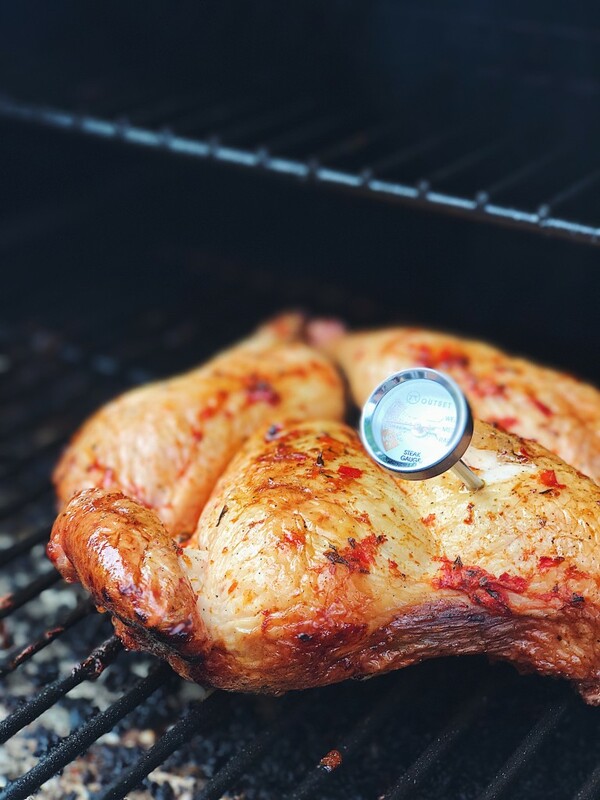 The second tip I have is to use a meat thermometer. 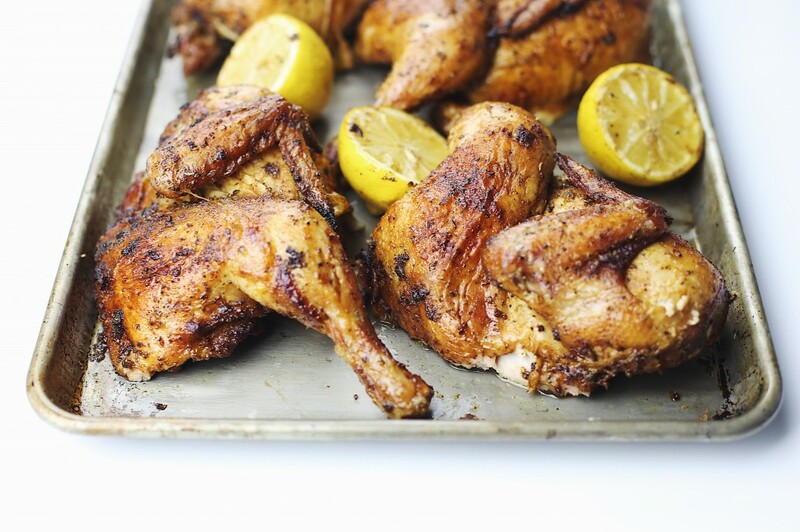 Chicken is very susceptible to drying out so you don’t want to cook it past 165°F. There is no shame in checking the temperature periodically. It’s not going to let any juices out and it is definitely better than dry chicken. I swear by the Thermapen when I need a thermometer. Another thing to keep in mind is that when cooking chicken on the bone, it tends to stay juicer so whenever you can, cook it on the bone. The dry rub I used for this recipe has a quite a few ingredients in it, but the exact recipe isn’t that important. You can use any dry rub you want or even just stick with salt and pepper. 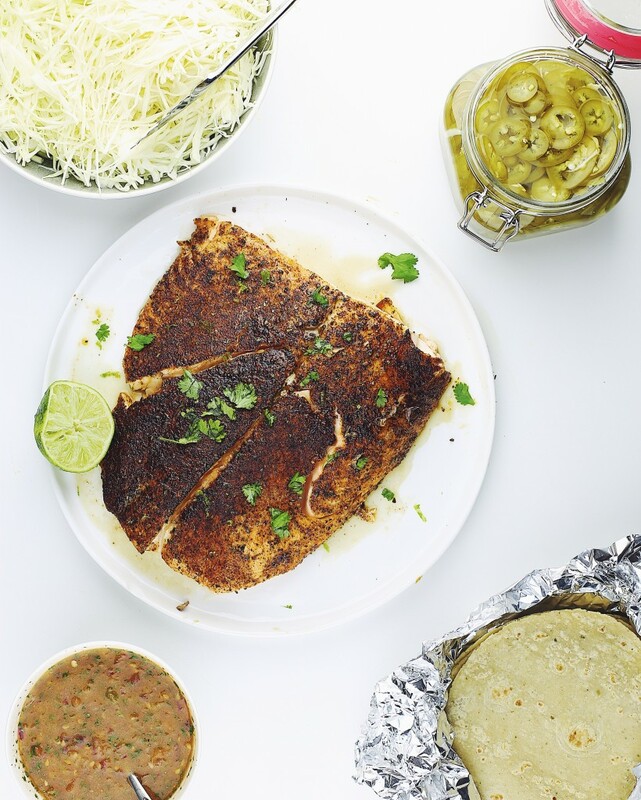 A lot of the delicious flavor in this recipe comes from the salsa verde anyway. The rub will also give you some extra, which you can store for later use. I like to make big batches of dry rubs so I have them on hand at all times. 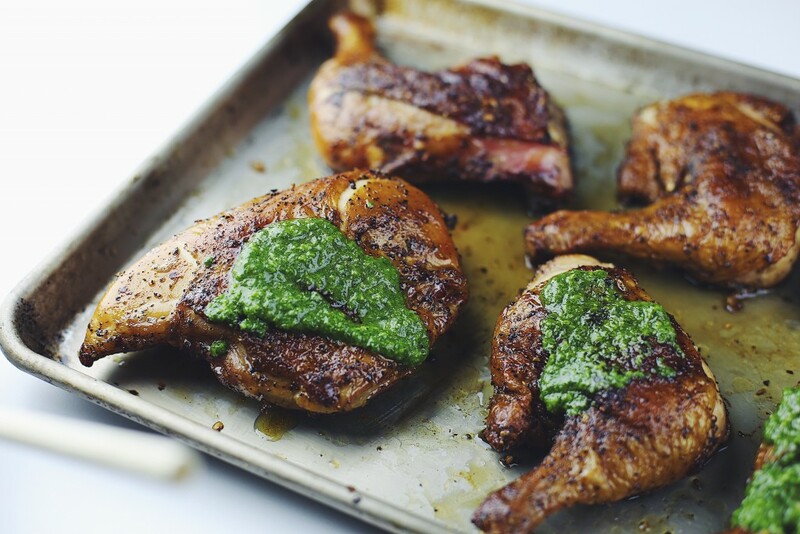 I love vibrant green sauces like these. 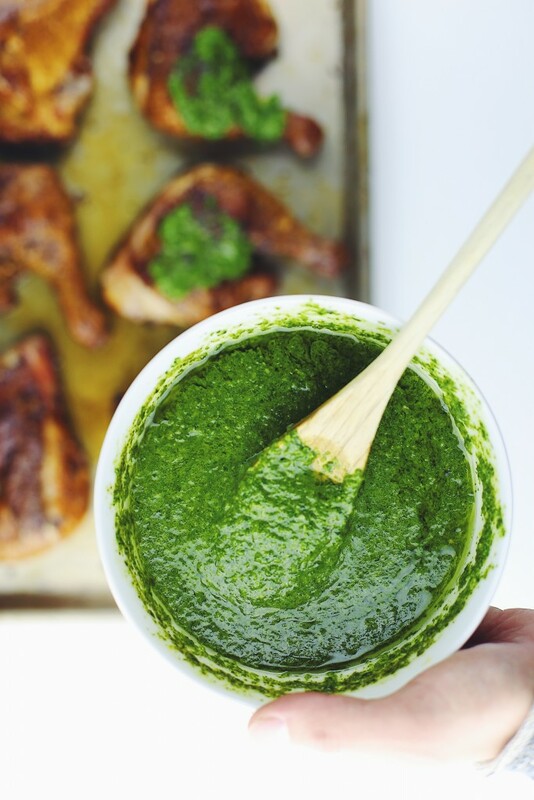 Whether it’s a pesto, chimichurri, or salsa verde, there are so many delicious sauce that you can quickly whip up with some fresh herbs, olive oil, and a few simple ingredients. They really take a standard meal to the next level. The sauce will keep for 3-4 days in the fridge and goes great on fish, steak, or even sandwiches. I cooked this chicken on my Traeger, but you could also use indirect/direct heat on a charcoal grill if you don’t have one. To make the rub, combine all the ingredients in a bowl and mix well. Cover, and set aside until ready to use. 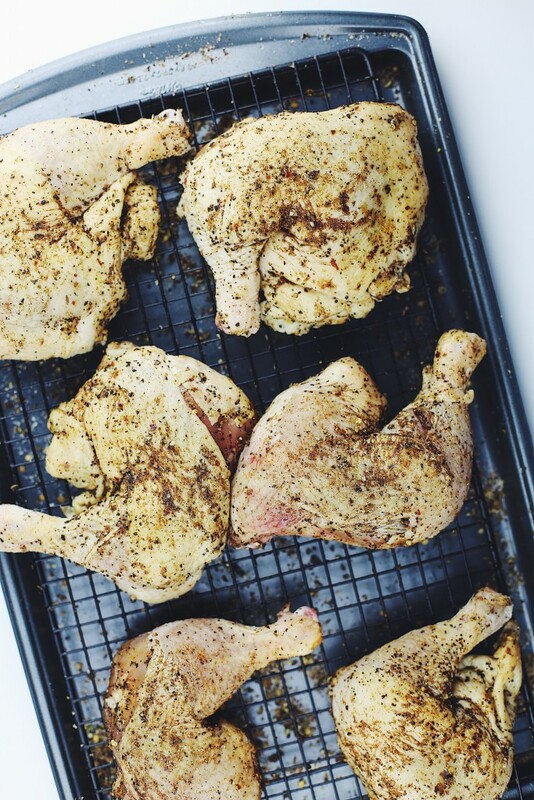 Place the chicken on a baking sheet or wire rack and fully coat in the dry rub. Use your hands to really coat the chicken ensuring you get in all the crevices and under the skin if possible. Place the chicken in the fridge uncovered for at least 2 hours and up to overnight. 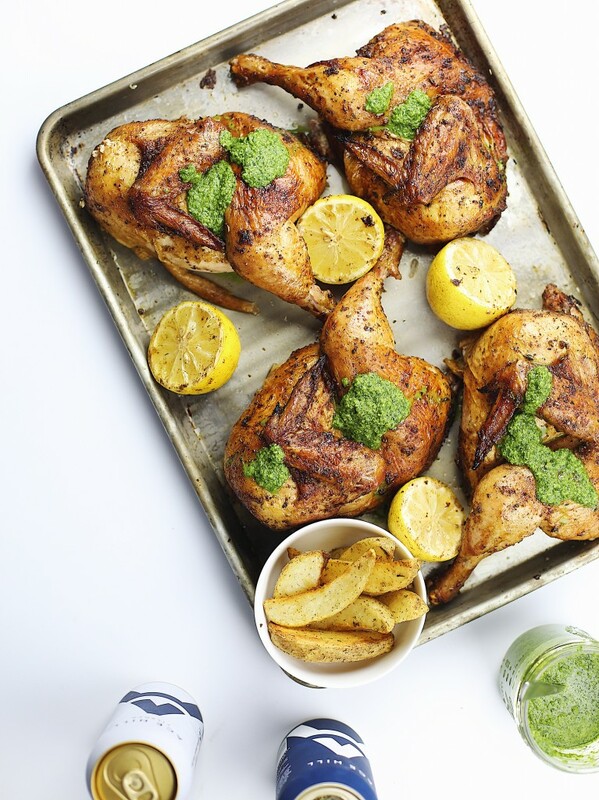 While the chicken is doing its thing in the fridge, make the salsa verde. Start by removing the seeds from the Jalapeños and then placing the seeded jalapeños in a food processor along with the garlic, and a drizzle of olive oil. Pulse together until very finely chopped into an almost paste like consistency. Add in the Cilantro and Parsley and continue to pulse until roughly chopped. 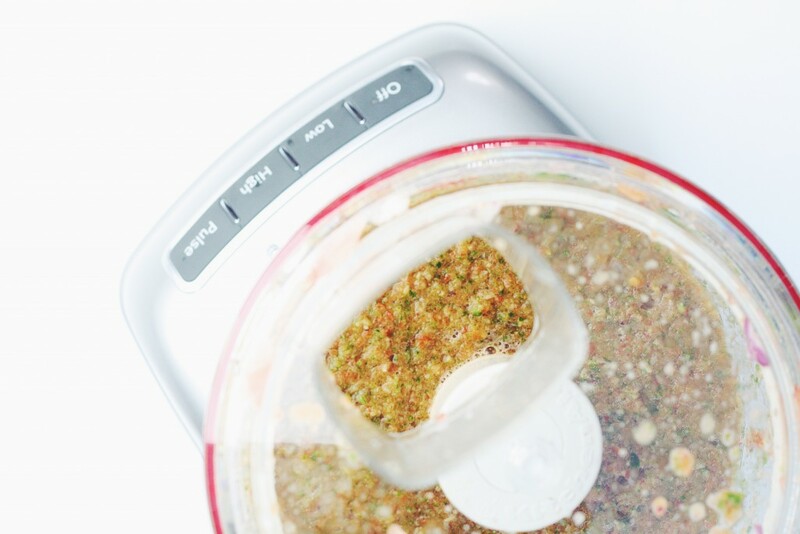 While the food processor is running, slowly drizzle in olive oil until smooth and your desired consistency is reached. Squeeze in the lemon along with its zest and season to taste with salt and pepper and then transfer to bowl. Store in fridge and then take it out while your chicken is cooking. 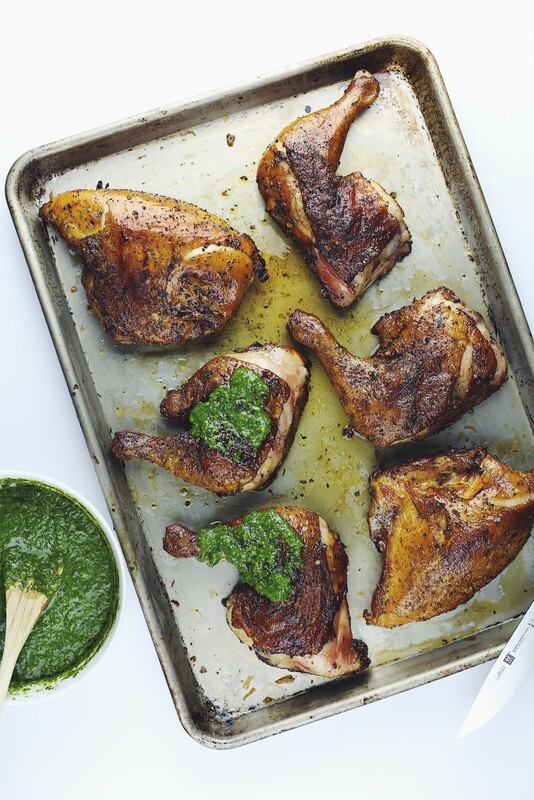 Take the chicken out of the fridge about 45 minutes before you want to cook it. To cook the chicken, start your Traeger on smoke with the lid open until the flame starts, about 5 minutes. Close lid and set to 225°F allowing it to preheat for 15 minutes. Place the chicken on the grill, skin side up and allow it to cook for about an hour and half to 2 hours or until the chicken reaches 155°F. At this point, remove the chicken to a tray, and then crank up the grill to 450°F. Allow it to preheat for another 15 minutes and then place the chicken back on, skin side up. Close the grill and allow the chicken to finish cooking until an internal temperature of 165°F and then remove. Allow chicken to rest for 10 minutes before serving. 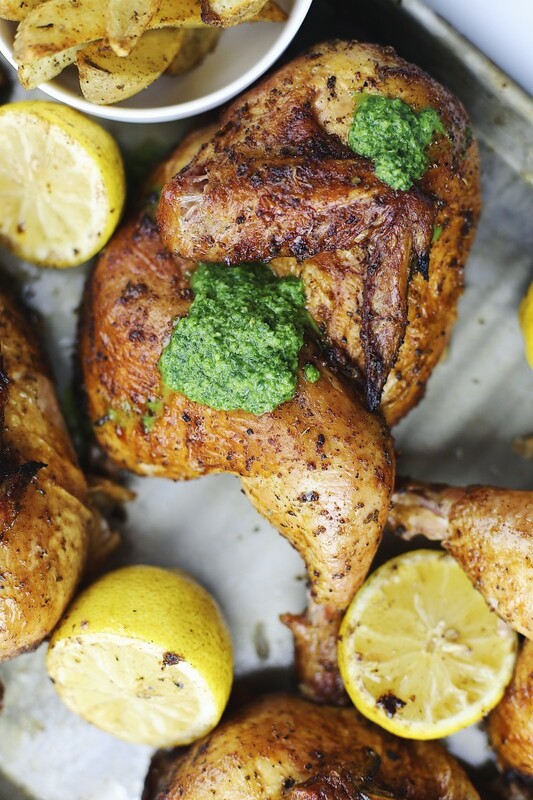 Slather the chicken with the jalapeño salsa verde to serve. Sous vide cooking is becoming more and more popular with home cooks all the time. I’ve been using it for about 2 years now and just in that time, I’ve seen a huge amount of growth in it. I actually recently read an article on Buzzfeed that included Sous Vide as a cooking trend for 2017 so we’ll see how that plays out. I’m not really surprised in it’s popularity at all. It’s such a great way to cook and ensure you get perfect and delicious results every time. I mostly use it to cook steak but there are so many different things you can cook sous vide. Lately I’ve been doing a lot of burgers with it as well. The appliances are also becoming more and more affordable with many different brands selling immersion circulators. 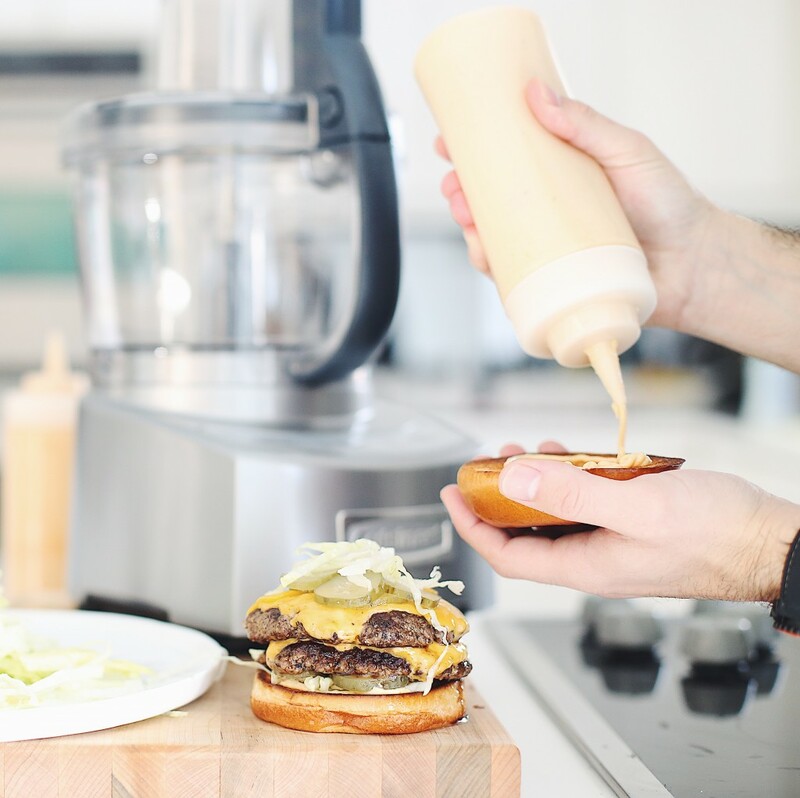 I use the Nomiku and if you are thinking of purchasing one, feel free to use my code “thechefdan” for a special discount on their website here. On to the lamb. 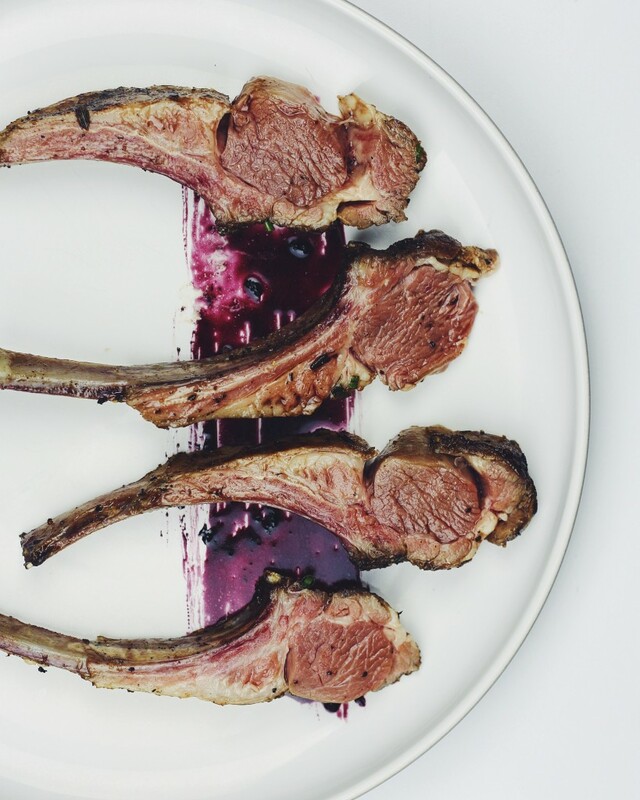 I think for a lot of people, cooking a rack of lamb can be a little intimidating. It’s not particularly hard, but I can definitely see why that perception exists. It’s a lot of pressure and is something that you don’t want to screw up. The same is true of any large roast, especially an expensive cut like rack of lamb. But when using Sous Vide, you don’t have to worry about screwing up the meat. You just set the water to your desired temperature, and can be confident that the meat will perfectly cook. 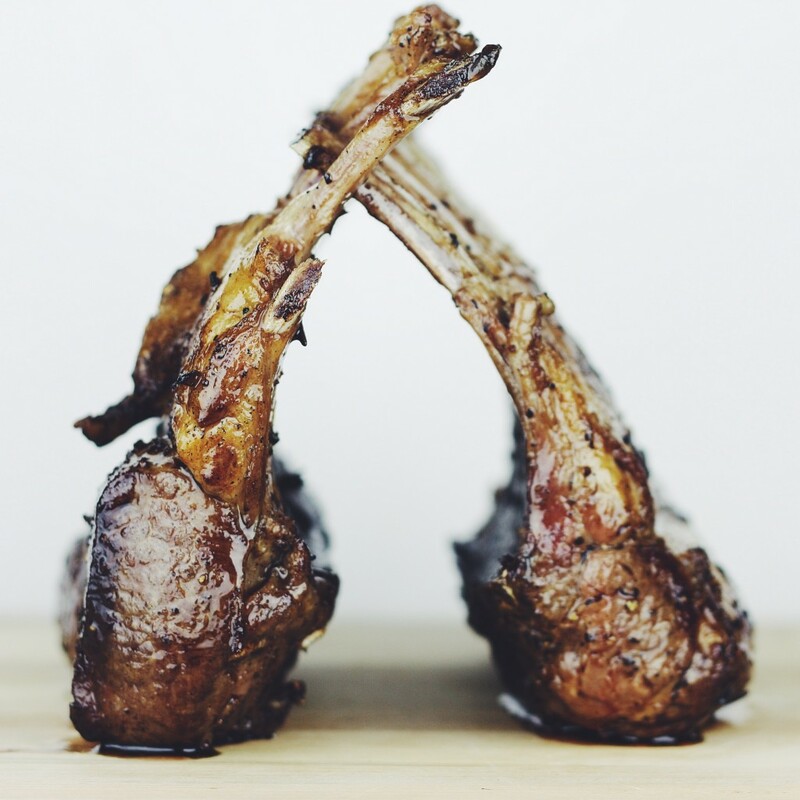 If buying the lamb at your butcher, ask them to french the rack of lamb. This involves trimming most of the meat and fat between the bones to expose them. If the lamb is already prepared in a grocery store and packaged, don’t worry if there is a bit of fat left on the bones, I actually prefer a little bit of fat left on anyway as you can tell from the pictures. As far as the timing goes for cooking the lamb, I usually like to leave my meat in the water bath for a longer, rather than shorter time. For a full rack like this, I would suggest anywhere from 4-8 hours. It won’t cook past your desired temperature but it will become more tender as it cooks longer. I also like my lamb around medium rare and find that 131°F is the perfect temperature but feel free to go higher or lower depending on your preference. If you’re into cooking Sous-Vide, you’ve probably noticed a lot of recipes involve shocking the bag in ice water after it’s done. If you’re searing your meat right away, this step is optional but I still tend to do it as it cools the meat down and ensures you don’t continue to cook it when searing. If you plan to sear the meat at a later time, shocking in ice water is intended to quickly chill the meat down to a safe temperature before putting it in the fridge. When searing my Sous-Vide meat, I always use a cast iron skillet and lots of butter. 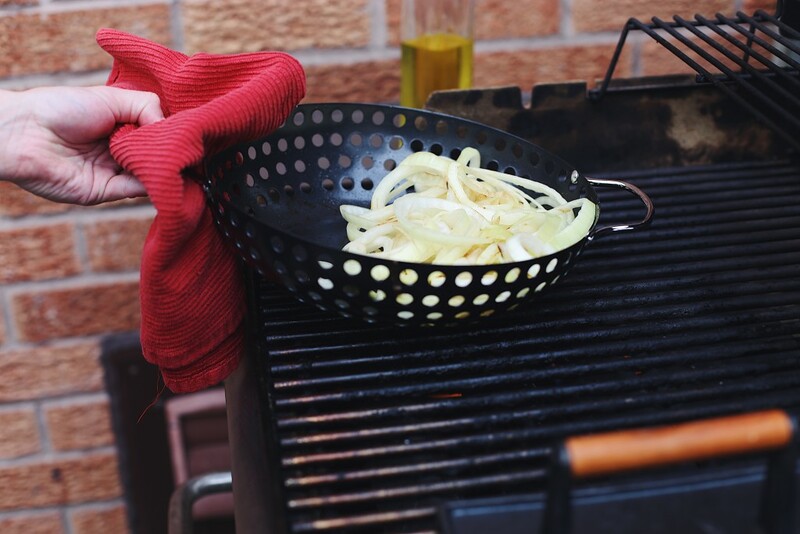 You can use any high-heat oil as a substitute and if you don’t have a cast iron skillet, you can use a bbq or do it under the broiler. 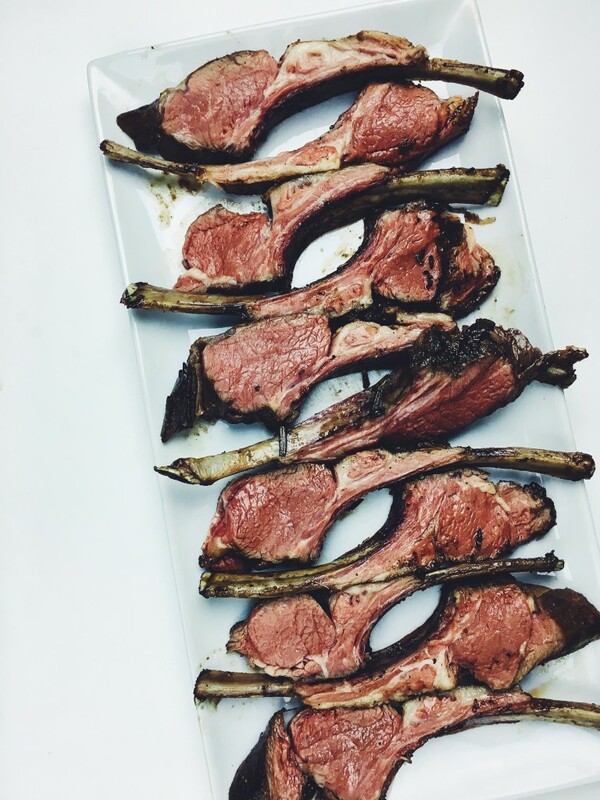 I like rack of lamb as an appetizer where everyone gets 2-3 ribs, but you easily make this a main course or smaller snack depending on how you want to serve it. I also like to serve it with a red wine reduction, mint chimichurri, or mint yogurt sauce. 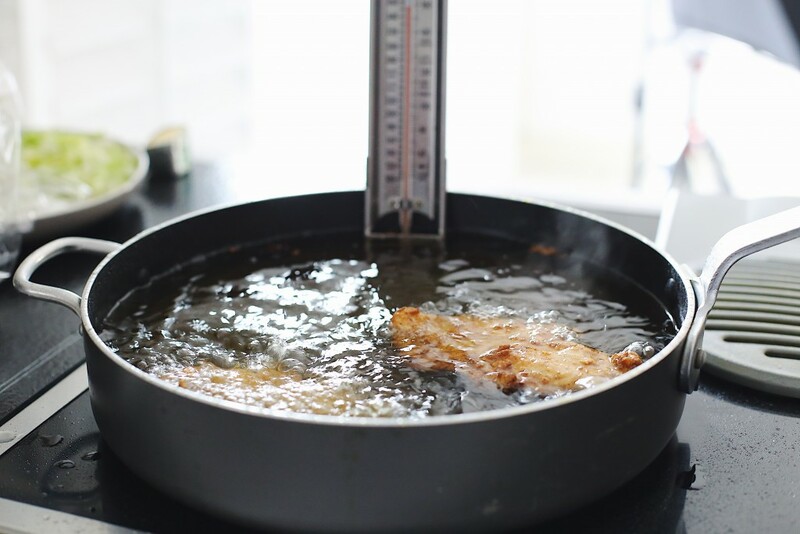 Start by filling a large pot or cooking safe container with water and attaching your immersion circulator. Set it to 131°F for medium rare. Pat the racks of lamb dry with paper towel and place them into large freezer safe Ziplock bags and seal using the water displacement method. Alternatively, seal them using a vacuum sealer with food safe bags. Once the water is at temperature, place the sealed lamb into the water bath ensuring it is fully submerged. Cover the cooking vessel with foil or saran wrap and allow it to cook for about 6 hours. After the elapsed time, carefully remove the bag and place it into a large bowl of ice water for 5 minutes and then remove the lamb from the bag and pat dry with paper towel. 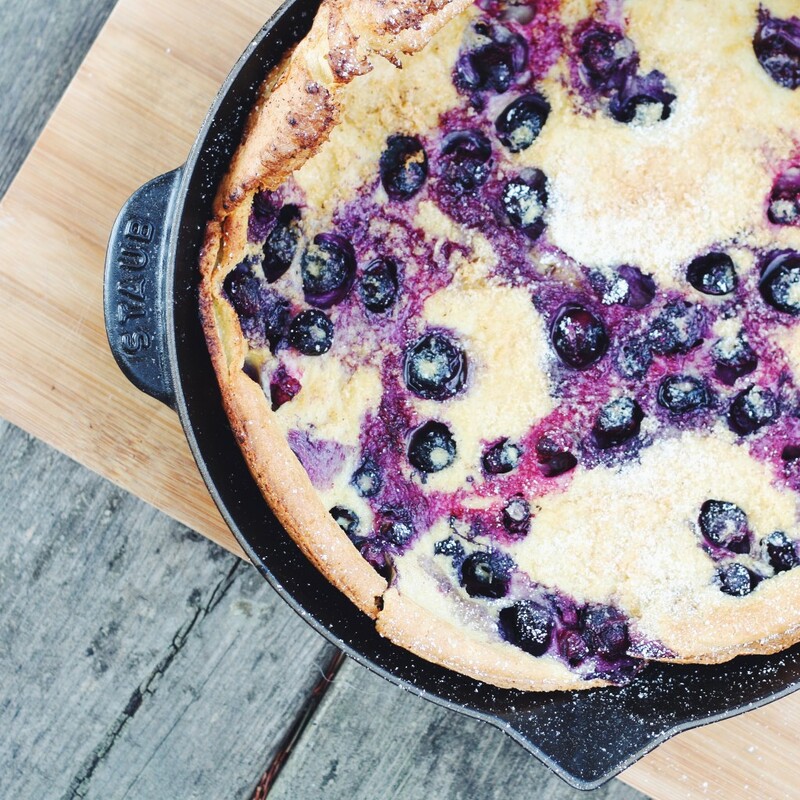 Pre-heat your cast iron skillet over high heat. In the meantime, liberally season all sides of the lamb with salt and pepper. When the skillet is very hot, melt in butter and then carefully place in the lamb. Add the garlic cloves and rosemary to the melted butter as well to baste the lamb as it sears. Sear each side of the lamb for about 1 minute until deeply browned and nicely charred. 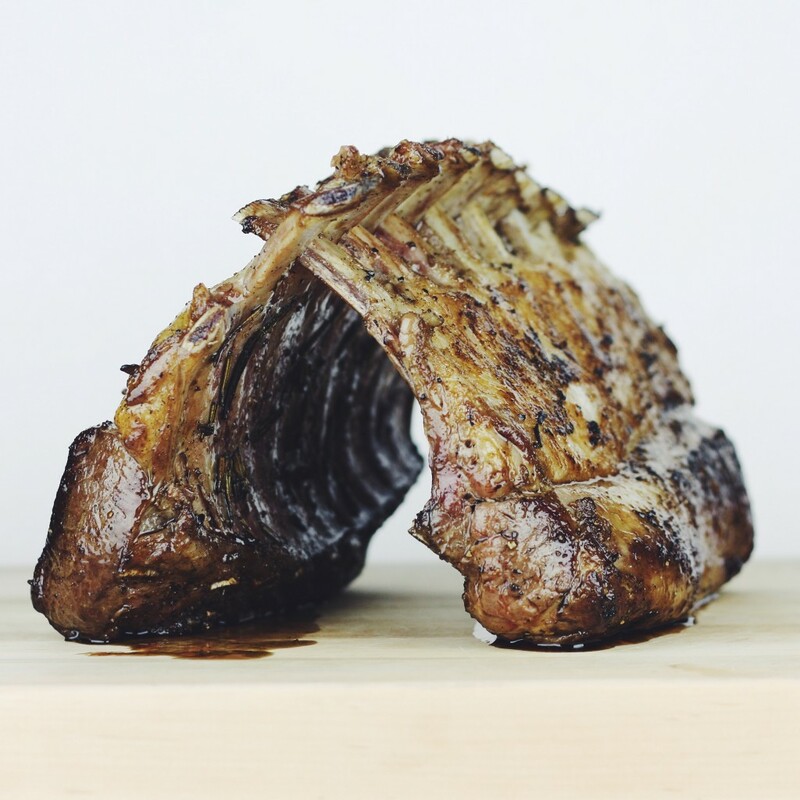 Slice the lamb into individual ribs by cutting between each bone to expose the perfectly cooked interior. Firstly, I want to wish everybody a Happy New Year. It’s hard to believe that it is 2017 and that this is the third year that I have been creating and sharing recipes with all of you! I just got back from a trip to Mexico so I thought tacos would be appropriate for the first recipe of the year. There are literally infinite ways to make tacos and almost anything can be used as the filling. 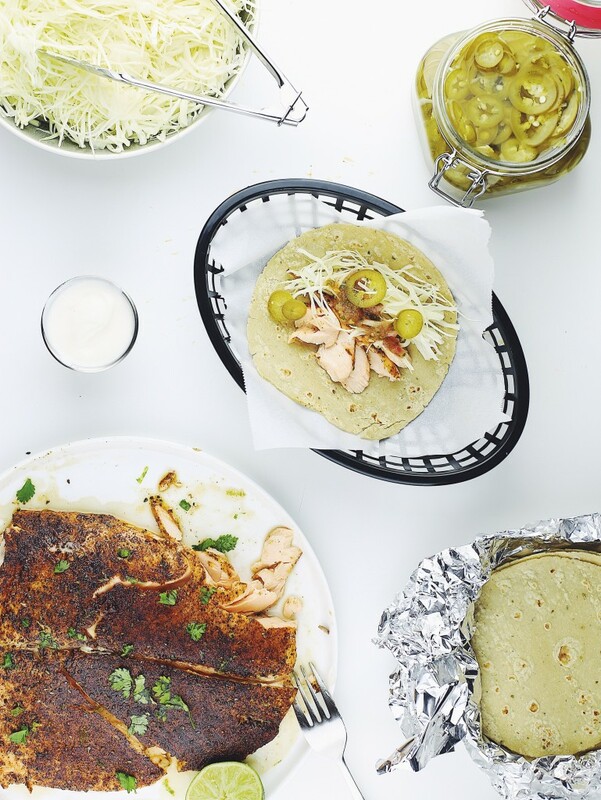 From classics like fish to more unique ideas like grilled avocado or Sriracha fried chicken, I think that anything tastes better when eaten in a tortilla. As much as I like trying new unique tacos, I think that the simpler is better and it doesn’t get much simpler than shredded chicken. Simply shredding up some grilled chicken and topping it with a bit of fresh salsa would make a great taco, but creating a deep and flavorful sauce that the chicken is cooked in takes it to the next level. The amount of flavor you can build in a relatively short period of time for this sauce makes it worth it any day. Since the base of these tacos is already wet, I tend to keep the toppings to a minimum as opposed to if I was using flank steak or beer battered fish. These tacos are totally delicious and satisfying on their own but I like to put out a few toppings to give people option when building their tacos. Thinly sliced jalapeños, shaved red onion, shredded cabbage, and cilantro leaves all make great toppings to add a refreshing bite to the tacos and they help create some texture. When it comes to tortillas, you can use either flour or corn, whichever you prefer. I like both but I much prefer corn tortillas when they are charred. If you have a gas stove, throw them right on the burner for a perfect char. If I’m not charring the tortillas I usually stick with flour, which is what I did with these. 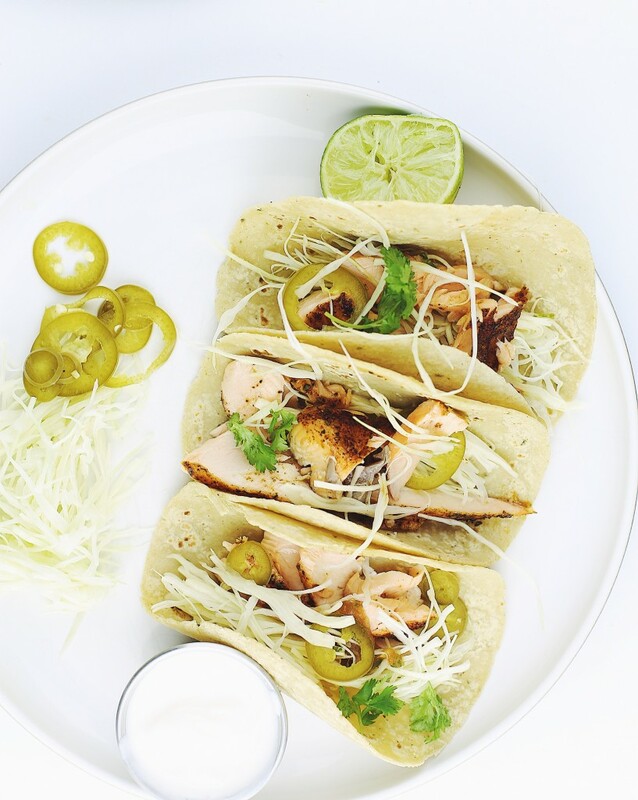 What I love about these tacos, and tacos in general is that they are suitable for so many different occasions. 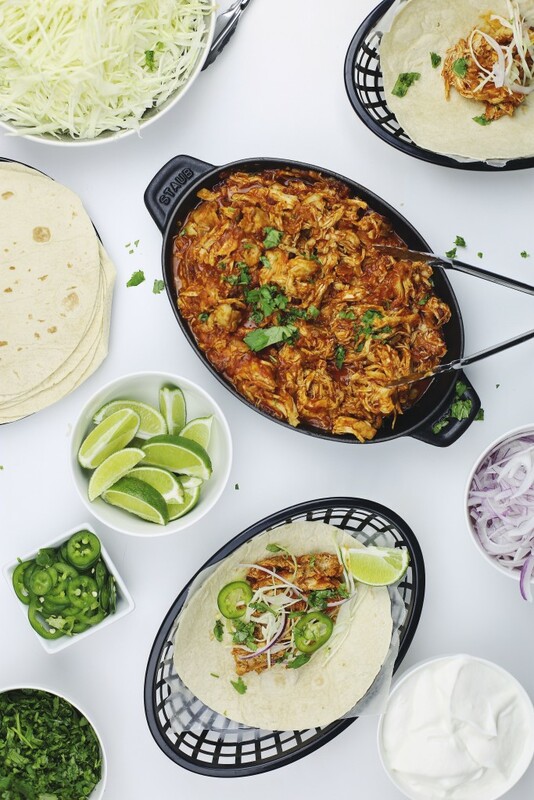 They make for a relatively quick weeknight meal that everyone will enjoy but they also work perfect for dinner parties or can be set up as a taco bar for a larger party if you increase the recipe. I wish that I had gotten a few more pictures of these tacos but as you will find out, they are incredibly delicious and not easy to resist. Season all of the chicken with salt and pepper and preheat olive oil in heavy bottomed pan over medium-high heat. Sear the chicken skin side down until browned, about 2-3 minutes (or until golden brown) and then flip and brown the other side. Remove chicken to plate and set aside. Lower heat to medium. In the remaining oil and rendered chicken fat, add Spanish onion and a big pinch of salt. Cook until softened, 5-7 minutes stirring often. Add in the chopped adobo peppers along with garlic and bay leaf and continue to cook for another 2-3 minutes, stirring often. Once the onion and adobo mixture is cooked down, place the chicken back into the pan, skin side up, along with any juices from the plate. Pour in the tomato sauce around the chicken and try to stir everything together around the chicken. Lower heat and bring the sauce to a light simmer and cover the pan. Cook for about 20 minutes or until the chicken reaches 165°F. After 20 minutes, carefully remove the chicken to a board and shred the meat off the bone using two forks. Continue to shred until desired consistency is reached. Ensure that there are no bones in the shredded chicken. Return the shredded chicken to the sauce and stir everything together. Season it to taste with salt and pepper. To serve, either transfer the chicken mixture to a separate dish or serve it right out of the pan. 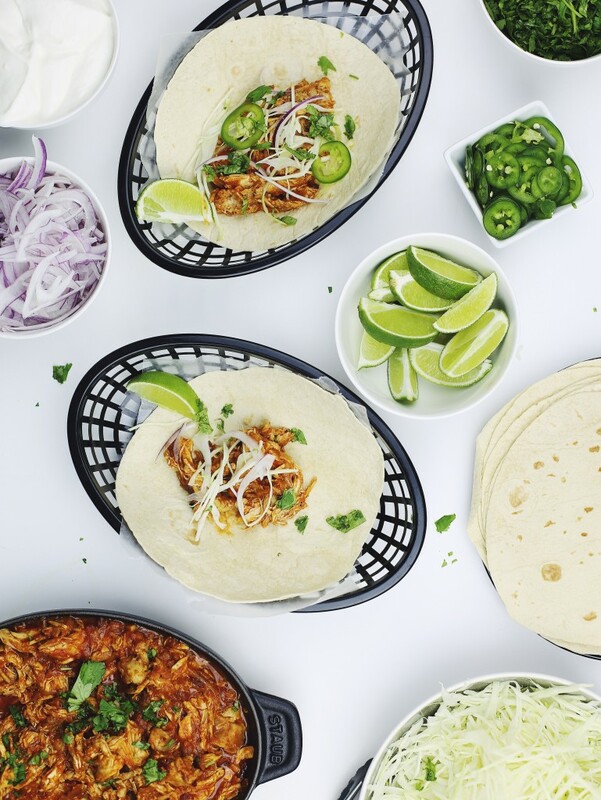 Serve the chicken along with your desired toppings and tortillas and allow everyone to build their own tacos. Believe it or not, this is actually one my favorite recipes that I have up here. 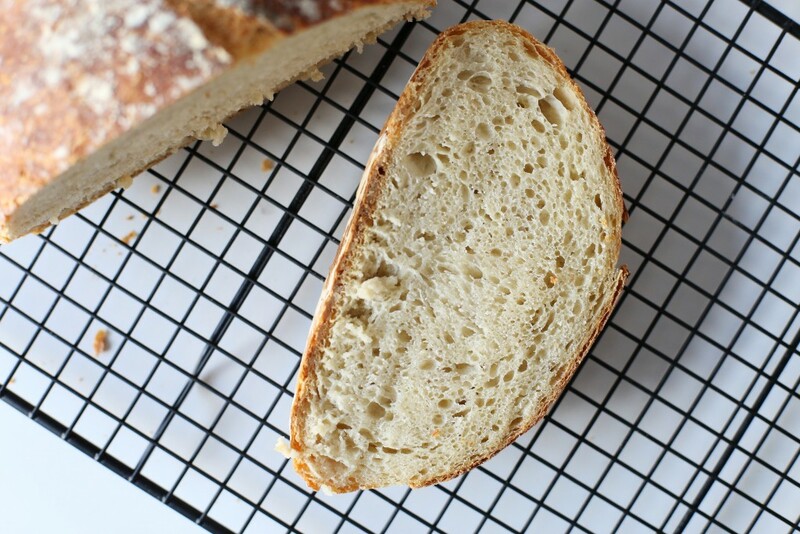 There’s just something about homemade bread that I’ve always loved. 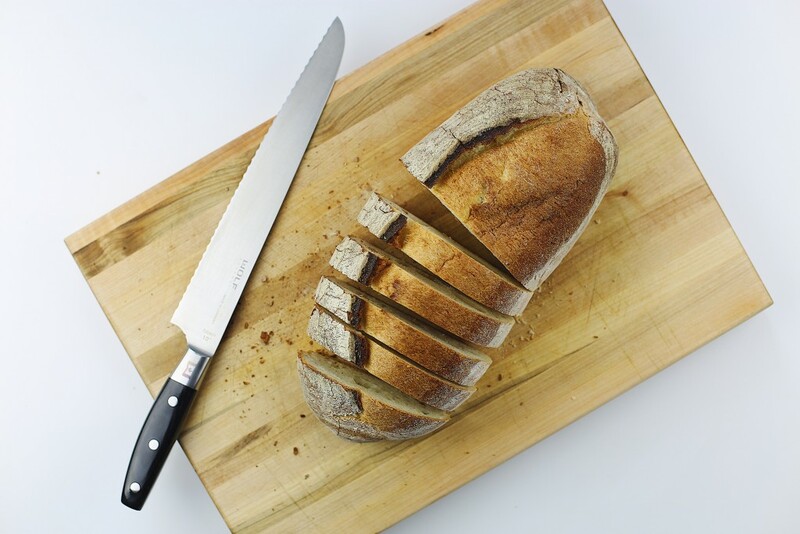 Nothing beats cutting into a loaf that you made with your own two hands. No matter what, it is always going to taste better than anything you could ever buy. 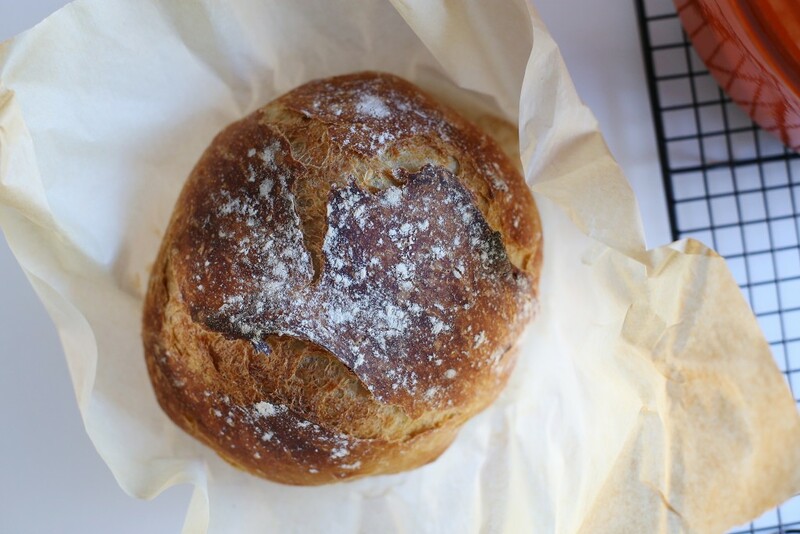 Now, there are tons of recipes for no-knead bread floating around the internet but I wanted to share it here as well. There are a few small things that this recipe has that truly make it amazing. I guarantee you that when you try this, you are going to be shocked at how simple it was too make and how incredibly good the results turned out to be. There really isn’t much you could do to screw this recipe up. Despite it being super easy to make, this recipe does require a bit of time. Part of what makes this bread so good is the long rise time that the dough gets. 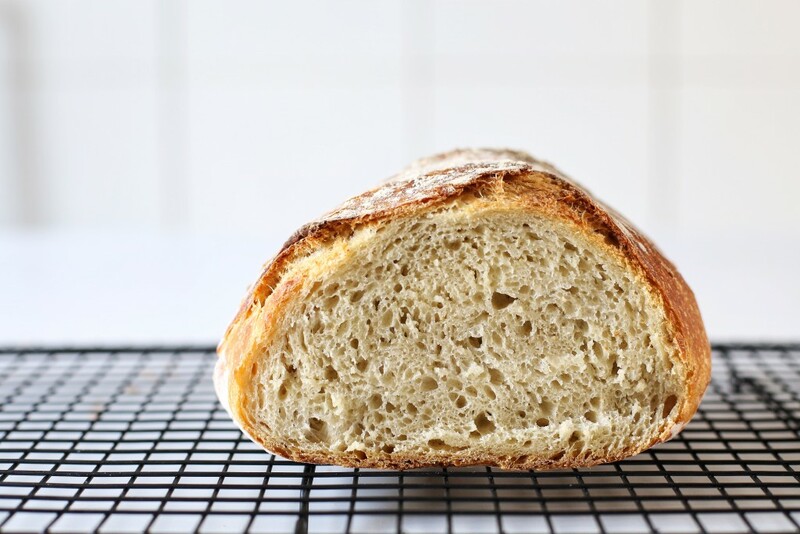 As opposed to a typical bread recipe that is kneaded, no-knead bread requires a relatively long time to ferment in order to build up the glutens that give the bread its great texture. I don’t really consider the long rise a drawback, it’s just something that you need to take into account and plan for. I like to let the dough rise for 16-18 hours so you’re going to want to prep it the night before you plan to bake it. Another thing to keep in mind is that you’ll need a large oven safe cocotte or dutch-oven. Cast iron is going to work best since it really locks in the heat but I think any sort of vessel would work. 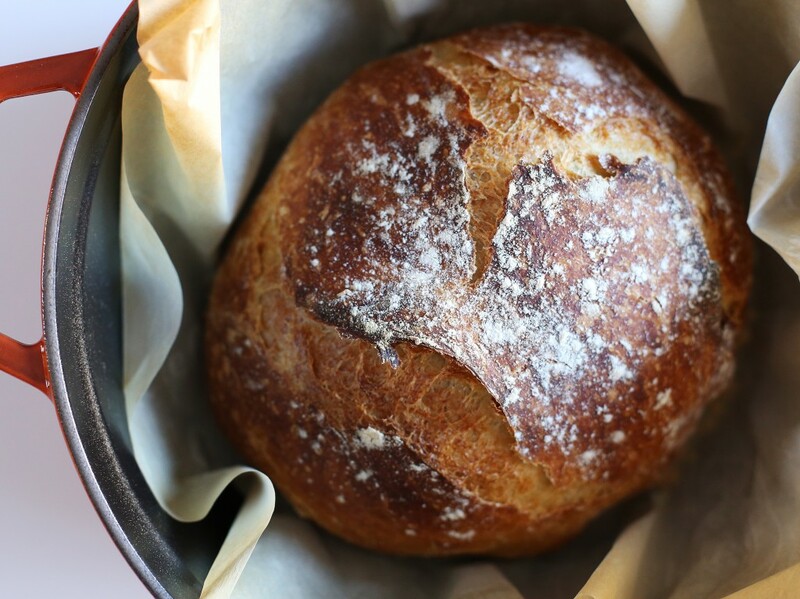 Cooking in the cocotte creates the steam necessary to get a super crisp and rustic crust. The first time I made this bread, I actually made it another two times in the same weekend. That’s three loaves in one weekend.. I think I may have a problem. I think its best hot and fresh out of the oven but another great use for it is to let it go a bit stale, then grill it with olive oil and rub with garlic. You really could use it for anything though and it will elevate whatever you use it for, whether it be grilled cheese, croutons, any sandwich or for dipping into soup. 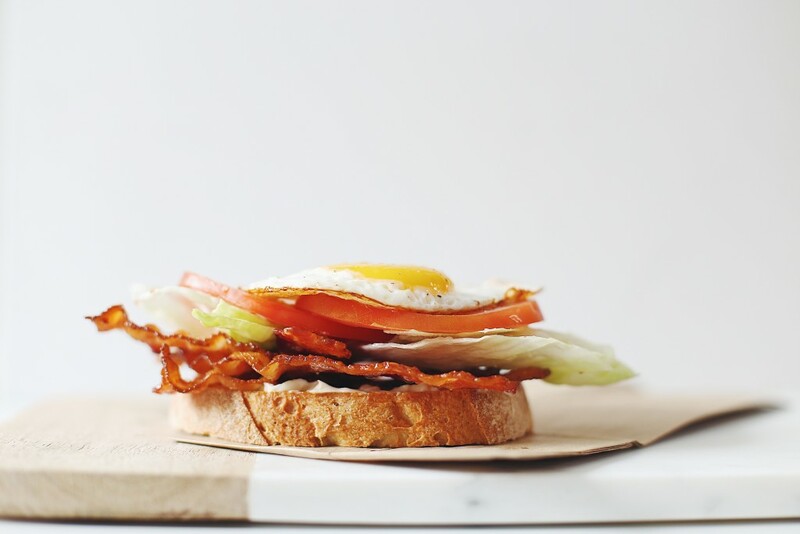 My favorite way to eat it is on its own and maybe with some runny eggs for dipping. Again, please don’t be intimated by the long rising time. This recipe really couldn’t be easier. Unlike many other types of baking, this recipe is really forgiving. 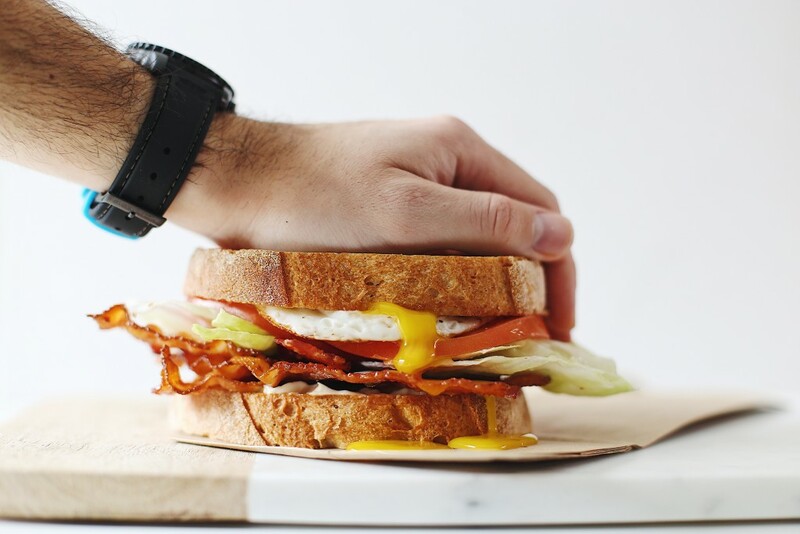 You don’t need to worry about super precise measurements at all. I’ve had a bit of inconsistencies in the dough due to laziness or because I was rushing and the bread has turned out perfect every time. It’s one of those things that you just need to get a feel for. In a large mixing bowl, whisk together the flour, yeast, and salt. Pour in about 1 1/2 cups warm water and stir everything together with a wooden spoon or spatula until the dough comes together. If necessary add more water 1/2 tablespoon at a time until a dough forms. At this point the dough will look rough and sticky. Cover the bowl with plastic wrap and allow to rise for 12-18 hours, ideally closer to 18. When ready to bake, place your cocotte or dutch oven into your oven preheated to 450°F and allow it to get really hot for at least 30 minutes. 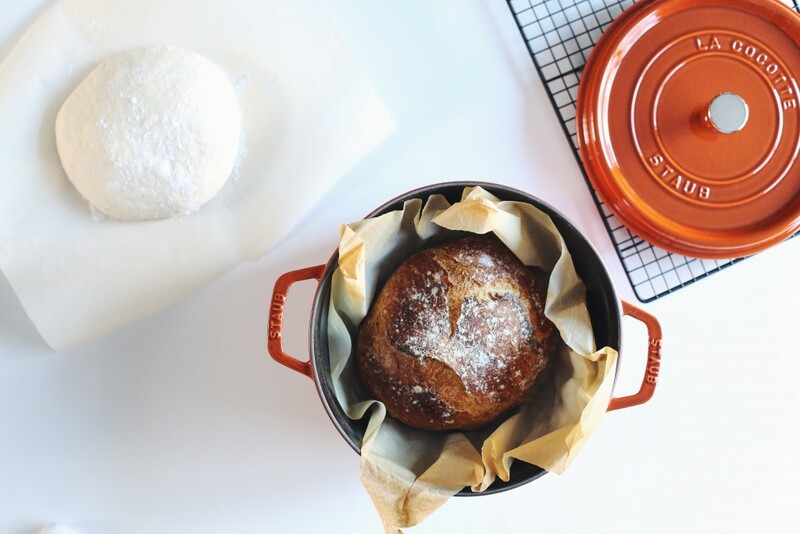 While the dutch oven is preheating, flour your hands very well, and dump the dough onto a piece of parchment paper. Form it into a ball tucking the edges underneath and then lightly dust with flour and cover with a piece of plastic wrap. Allow it to rise for another 30 minutes to an hour while the dutch oven is preheating. After it’s preheated, using oven mitts, carefully remove the dutch oven and transfer the dough into the pot. I recommend transferring it with the parchment paper. It’s cleaner and makes for easier transferring. Just pick up the corners of the paper and carefully drop it in. Return lid to dutch oven and place it back in the oven. Finally, remove the bread from the dutch oven and allow it to slightly cool before cutting into it and enjoying. A good bowl of Pho is one of my favourite things to get for take-out. It’s one of those take-out items that is just as good at home as it is in the restaurant. 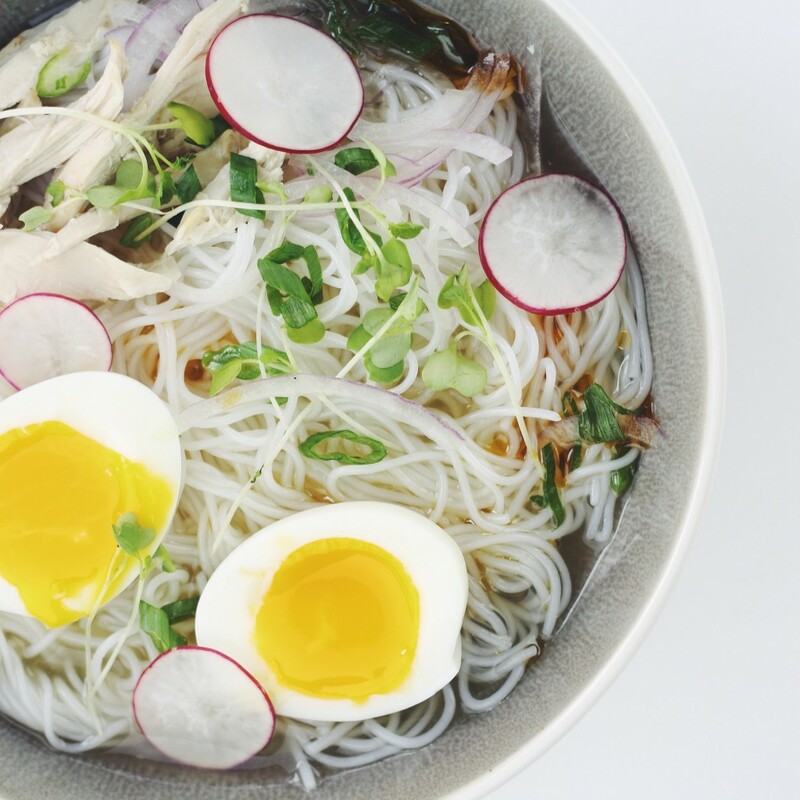 Since the broth is packed separate from the noodles and all the toppings, everything stays nice and fresh. 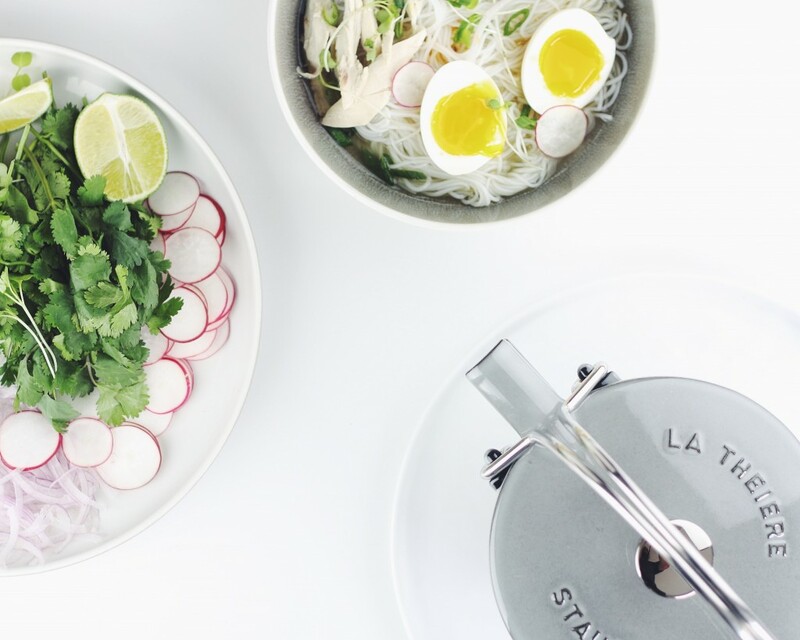 Now, I know this recipe is far from an authentic Pho Ga. I’m definitely not claiming that it is traditional or anything similar to what you might get in a Vietnamese restaurant. But this is my own version and it’s inspired by my favourite take out spot. There are a few things that make this recipe so delicious. The star of the show is really the broth. Without a good broth, you’re not going to end up with an enjoyable soup. The second is all the toppings. I love all the fresh and bright toppings, they really make the soup. I like to prep a big plate of all the toppings and serve it alongside the soup so you can keep adding more as you go. The broth for this was adapted from a friend of mine’s blog. You can check out the original right here, on Christine’s blog, What Do You Crave. The only reason I even made changes were out of convenience and because of what I happened to have on hand. I didn’t have leek so I used green onion instead. I also had some cloves so I through those in the broth as well. The only other change I made was grilling the vegetables on the BBQ before adding them to the pot whereas Christine baked them in the oven. I was really impressed with how flavorful the broth came to be in such a relatively short time. 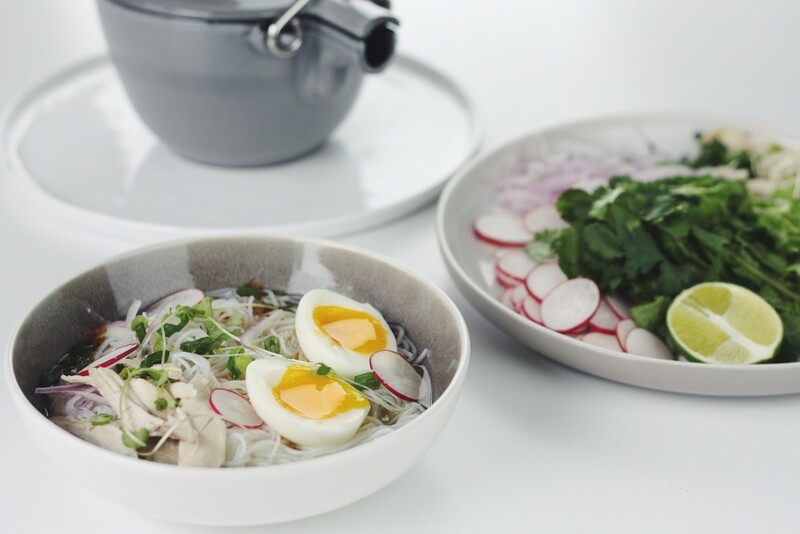 It may seem like kind of pain to make your own broth from scratch but it really is pretty effortless, and is so much better than any result you’ll get using a boxed chicken stock. I made the broth a day in advance. This really broke up the process for me and made it feel even simpler. It’s also easier to skim off excess fat after the broth has chilled in the fridge for a bit. Another cool thing I did was serve the broth out of my new tea kettle. It was a fun way to serve everything at the table. To serve everything up, make a big plate of all your toppings. You don’t have to use exactly the same things I used. You can add in whatever you want. 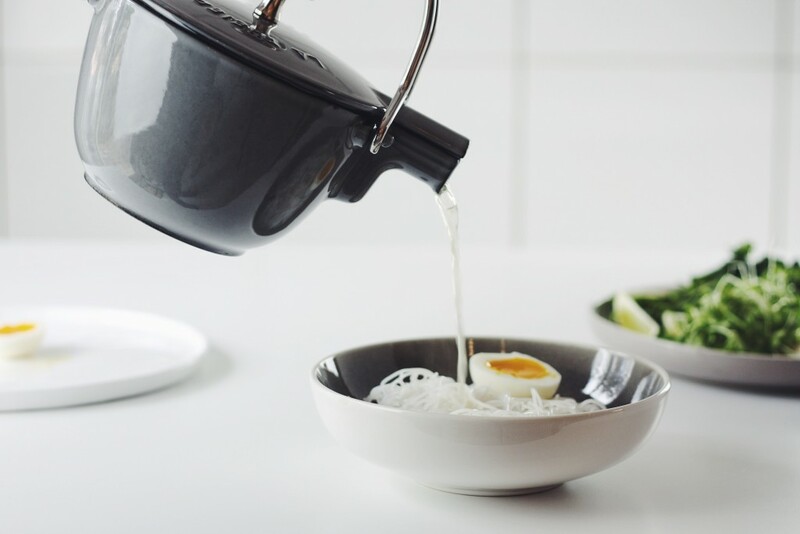 Once you’re toppings are all set up, add your noodles to the bowl and then pour in the broth. Top the soup to your liking and you’re good to go. To make the broth, char the onion, green onion, and ginger on a grill (or under broiler). Don’t worry about removing the skin from the onion, it will easily come off once its charred. You want to let everything cook until it’s softened and nicely colored. The green onions will go quick but the yellow onion and ginger can stay on for about 15 minutes or so. Remove from grill, and then add to a large stock pot with the chicken. Be sure to remove any of the remaining charred skin off the onion. Bruise the lemongrass with the side off a knife and then put that in as well . Add the cloves, star anise, chili, sugar and salt, and then cover with with about 12 cups of cold water. Bring it to a boil skimming off the fat as it accumulates on top. Reduce the heat to a simmer and allow it to cook for about 45 minutes or until the chicken is fully cooked. At this point, carefully remove the chicken and shred the meat off the bone. Set the shredded meat aside for now. If you can, try to cut the chicken carcass into several pieces, this will help extract additional flavour for the broth. Put all the remaining bones back into the broth for another 1-2 hours with the pot partially covered. 1 hour will be fine but you can let it go for an additional hour or so. After 1-2 hours. Remove the chicken bones and then stir in the miso paste to dissolve. Remove and discard all the remaining vegetables and then put the soup through a fine mesh strainer. There will still be fat on top that needs to be skimmed off. At this point you can either begin to prep your toppings, or chill the broth and save it for the next day. To get ready for serving, cook noodles according package directions and then rinse under cold water. If you are serving with soft boiled eggs, cook them for 6 and a half minutes and then peel them carefully under running water. Get all your other toppings ready and place them together on a plate. Hard to believe that Halloween is already here. Not really complaining though. Fall is a great time of the year and there are so many great fall recipes that I’d like to make. 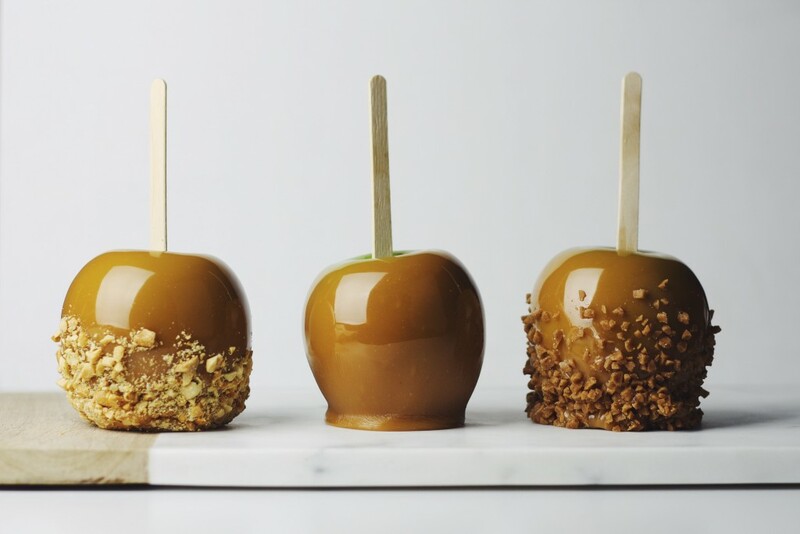 These caramel apples just happen to be one of them. 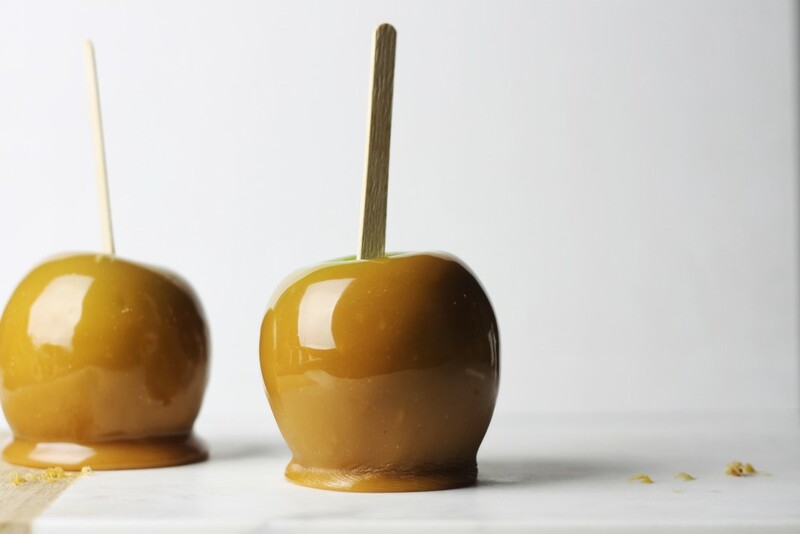 Making caramel apples at home is pretty simple but for some reason I haven’t always gotten the best results. The main issue that I had, and I think it’s an issue that others struggle with as well is getting the caramel to stick to the apples. What would usually happen to me was I would make the apples, stick them in the fridge to set, only to find that when I came back to check on them, most of the caramel had dripped down to the bottom of the apple. After a few quick searches on google I finally have found the solution. Apples have a waxy coating around them. I’m not going to get into any details about it, but the one relevant thing about the wax is that it stops the caramel from properly adhering to the apple. I figured that washing the apples under cold running water was enough to get rid of the coating but apparently not. The real trick is to dip the apples into boiling water with a splash of vinegar added to it and then shock them in cold water and rinse them off. This technique will get rid of the wax and ensure the caramel sticks. Since I learned about this trick, my apples have been coming out perfect. Another tip is to make sure you put the apples in the fridge as soon as possible after dipping them. This will help the caramel set and reduce any big pools of caramel at the bottom of the apple. I actually kept a parchment paper lined baking sheet in the fridge while I was making my apples so it would be nice and cold by the time they were ready. Other than that, there really isn’t much to it. I don’t bother making my own caramel for these, I think the pre packaged caramels work perfect. As far as sticks go, there are several options. You can buy wooden craft sticks at any crafts store. Chopsticks also work pretty well if you have those lying around. But I find that popsicle sticks actually work the best. The flat surface seems to help keep a secure fit while dipping. 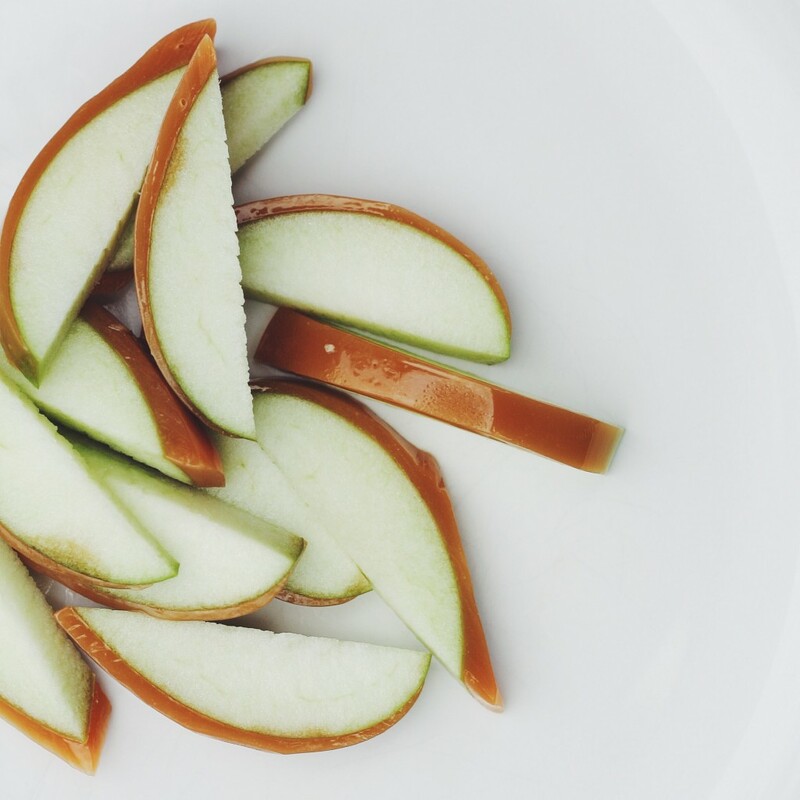 You can stick with just caramel for a classic look, but it’s also fun to dress the apples up with different toppings. I kept it simple and went with skor bits and chopped peanuts, but the possibilities are pretty endless. You could add chopped pretzels, m&m’s chocolate chips, drizzled chocolate; you get the point. Melt the caramels along with the cream, vanilla, and salt in the microwave on 50% power (stirring every minute) or over a double boiler. Remove the stems from the apples and insert the popsicle sticks. 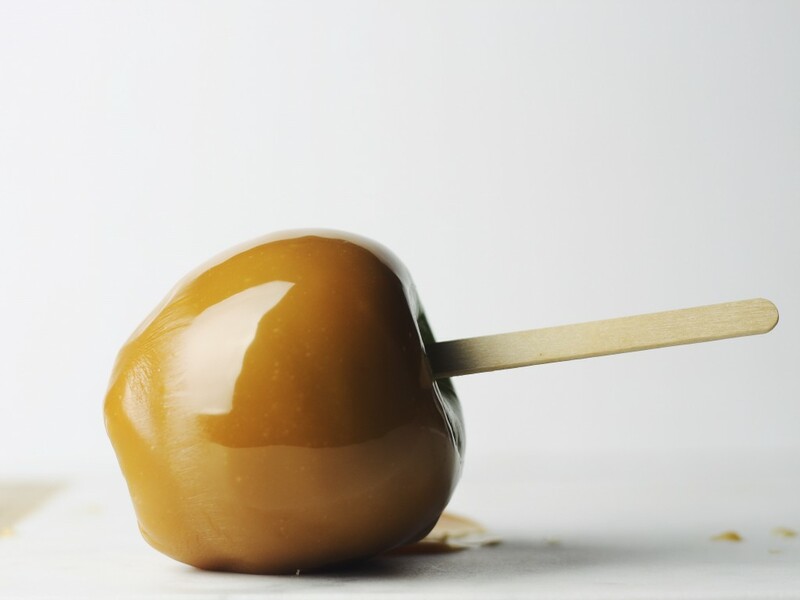 If you have a thermometer, you’ll want the caramel to be between 180° and 200°F while dipping. It’s not too important to worry about though. One by one dip the apples into the caramel. I like to leave a bit of green showing but you can go right up to the stick if you prefer. You may need to tilt the bowl/pot and rotate the apple to get full coverage. 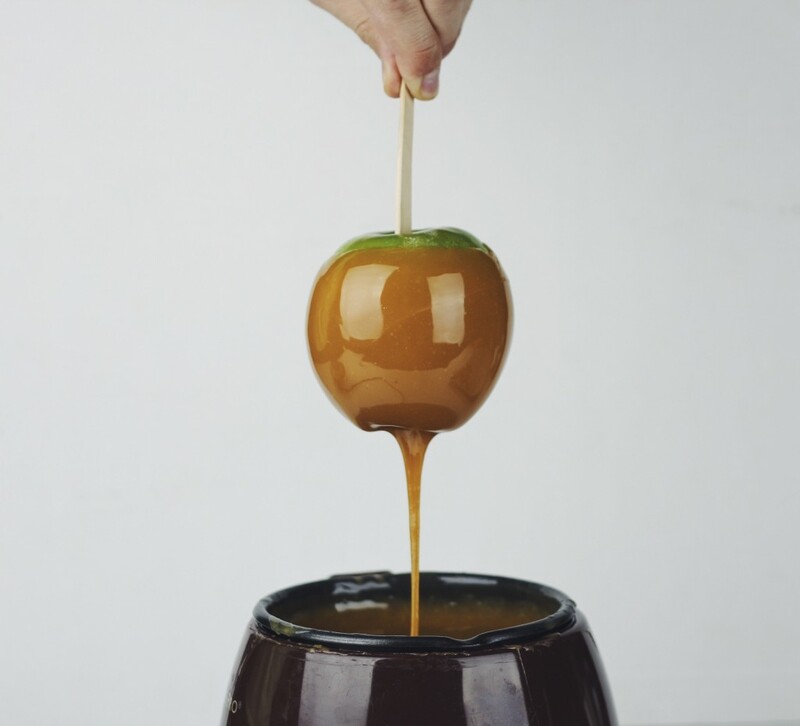 lift up the apple and hold it for at least 30 seconds so the excess caramel drips off. Flip it upside down for another 15-30 seconds while the caramel evenly spreads around the apple and then place on a parchment paper lined baking sheet. You’ll find that you may need to hold the apple for a bit longer or in different orientations in order to keep an even layer of caramel all around the apple. It takes a bit of practice but you’ll get the hang of it after a few tries. 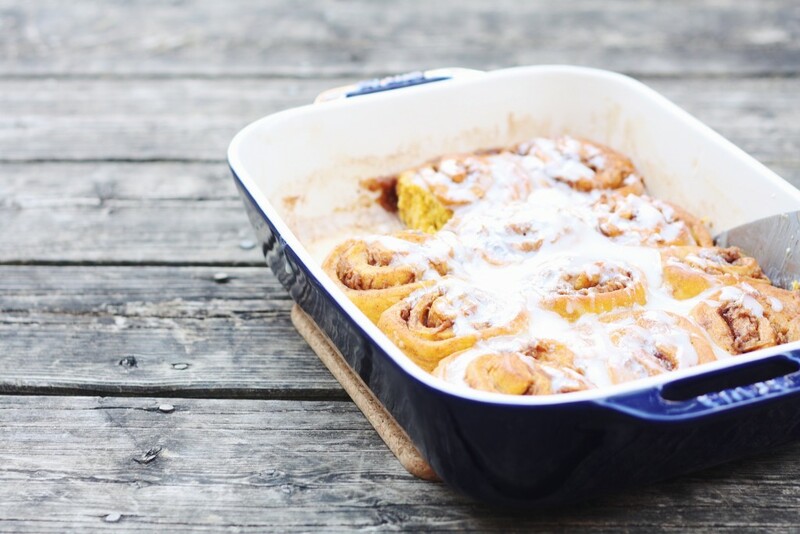 If you read my last post on pumpkin cinnamon rolls, you’ll know that I was never much of a pumpkin fan. I didn’t necessarily not like it, it was just something that I tended to avoid for whatever reason. After making those rolls and really enjoying them, I had a whole bunch of leftover pumpkin purée that I needed to use up. I was in the mood for pasta and I knew that pumpkin would make a great base for a sauce. One of the great things about this recipe, and many other pasta recipes is that it can be made with ingredients that you probably already have in your pantry and fridge. I used a few fresh ingredients like sage and thyme but if you don’t have those, you could easily skip it or use dried herbs. Dried pasta is also something that I always have around. 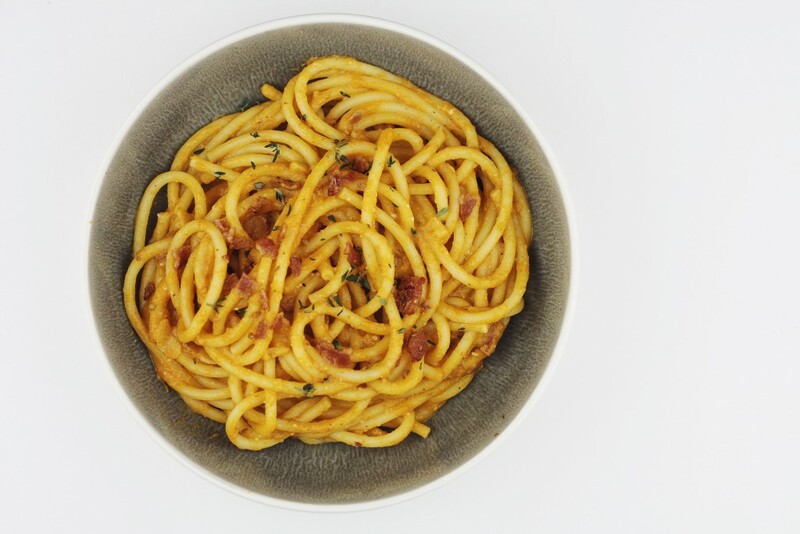 If you aren’t familiar with Bucatini, its kind of like a thick spaghetti. It’s really good and perfect for hearty sauces like this or something like a bolognese. If you don’t have it, regular spaghetti is a good substitute. 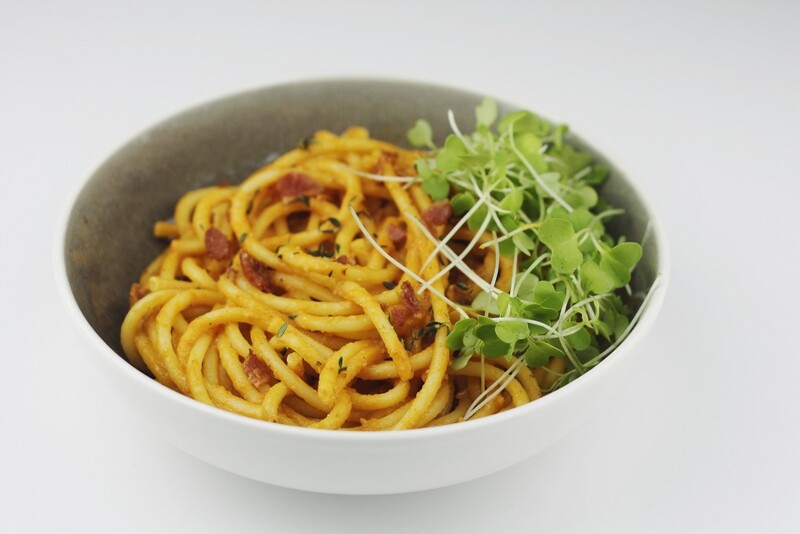 Also, you can easily make few substitutions to make this pasta vegetarian. Obviously skip the bacon. You don’t need to replace it with anything but I think a good textural substitute is sun-dried tomato. They go crispy but still keep their chew when fried kind of like thick cut bacon. And you can swap the chicken stock with vegetable stock or even just some extra pasta water. Make sure you taste the sauce and season it to your liking as you’re cooking. I like to add a little bit of salt here and there throughout the cooking process. As the sauce cooks, the flavors change and meld together. Needless to say, I will definitely be making this pasta again. Start by bringing a large pot of heavily salted water to boil. Don’t be shy with the salt. Cook pasta about 2 minutes less than package directions so it’s very al dente. It will continue to cook once it’s in the sauce. Make sure to save at least 1 cup of the pasta water once the pasta has been cooking for a while. While the pasta water is heating, get a large pan going on medium heat and fry the bacon until it’s crisp. Remove bacon to paper towel. Add the onions along with the sage and cook until the onions are translucent stirring often, about 5-7 minutes. When the onions are translucent, add in the garlic and thyme and allow them to cook for about a minute more, stirring so the garlic doesn’t burn. Add the pumpkin to the pan as well as a small pinch of cinnamon and nutmeg and allow it to cook in the oil for a few minutes while stirring. Add in the tomato and chicken stock and allow it to reduce slightly. Now it’s time to add the Pasta. If you were able to time it right, you can transfer the pasta directly from the cooking water into the sauce but if you already strained the pasta that’s fine too. Crumble most the bacon on top and then add the reserved cooking water and cream to the pan along with the parmesan and toss everything together really well. I like to get in there with a pair of tongs and really mix everything up. If the sauce is too thick at any point just add a bit more pasta water or stock. 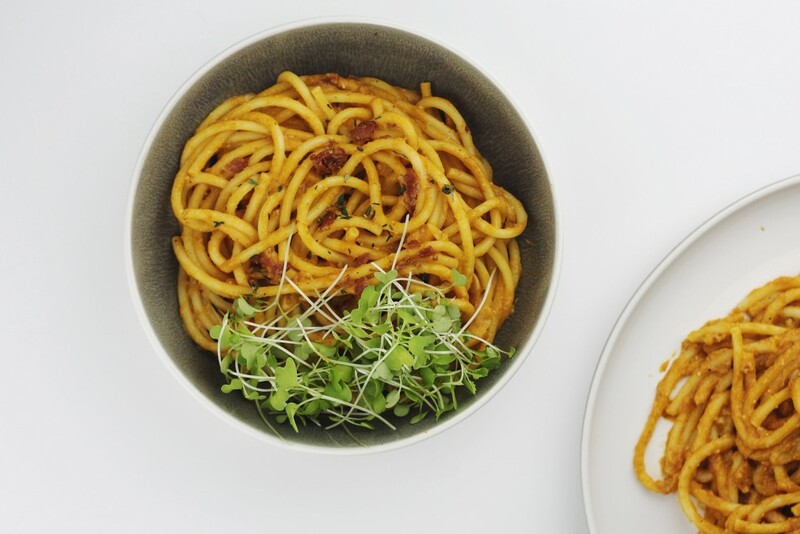 Transfer the pasta to plates or bowls and top with remaining bacon and some more fresh thyme if desired. I also topped my pasta with some micro greens for a bit of additional color. Firstly, I want to apologize for not posting any new recipes in a while. I’ve been super busy but am going to try to continue posting on a more regular basis. Now that that’s out of the way, lets talk about these cinnamon rolls. There not you’re average cinnamon rolls. They have pumpkin in the dough, and apples in the filling. I’ll be honest, I’ve never really been a fan of pumpkin, but I figured I must be missing something since every recipe this time of the year seems to have pumpkin in it. That being said, I wanted to try out a pumpkin recipe. I also wanted to eat cinnamon rolls. So that’s how this happened. I think this was a good place for me to try it out. The rolls definitely had a pumpkin flavor, but it was subtle and not overpowering at all. It also seemed to blend perfectly with the apple cinnamon filling. 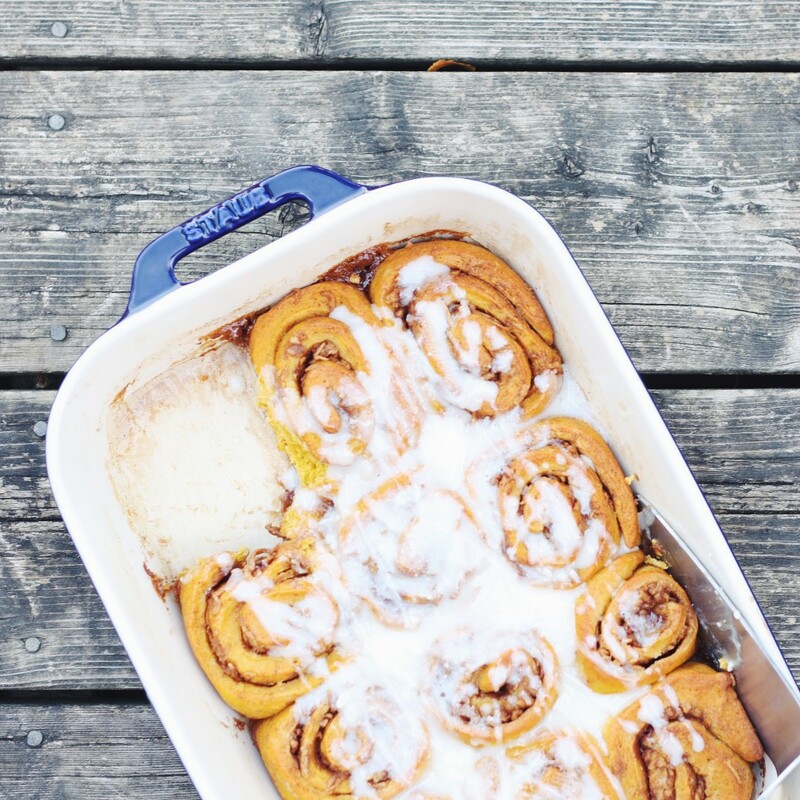 These rolls would be perfect on any fall weekend, but I think would be especially good for a thanksgiving brunch. To make the dough, start by gently heating milk in a small saucepan (about 110°F) you want it to be warm, not hot. Turn off the heat and add in the yeast giving it a stir to dissolve. Allow 5-10 minutes for the yeast to activate. The milk should look foamy. If it’s not, the yeast may have gone bad. While the yeast is activating, melt the butter (1/4 cup) and allow it to cool slightly. In the bowl of a stand mixer, combine the flour, sugar, salt, and spices. Give it a quick stir to combine before adding the melted butter, egg, pumpkin and the milk/yeast mixture. With the dough hook attached, mix on low for about 5 minutes stopping to scrape down the edges if necessary. Add mixture to a large boil greased with oil and cover with plastic wrap. Allow it to rest in warm place until doubled in size, this should take about an hour to an hour and a half. When the dough is almost ready, prepare the filling. Start by peeking and grating the apples into a paper towel lined bowl. Give the apples a bit of a squeeze in the paper towel to get rid of excess moisture. Combine the apples with brown sugar and cinnamon and stir to combine. Melt the butter and set it aside for now. Dump the dough onto a floured surface and dust the top with a sprinkle of more flour. 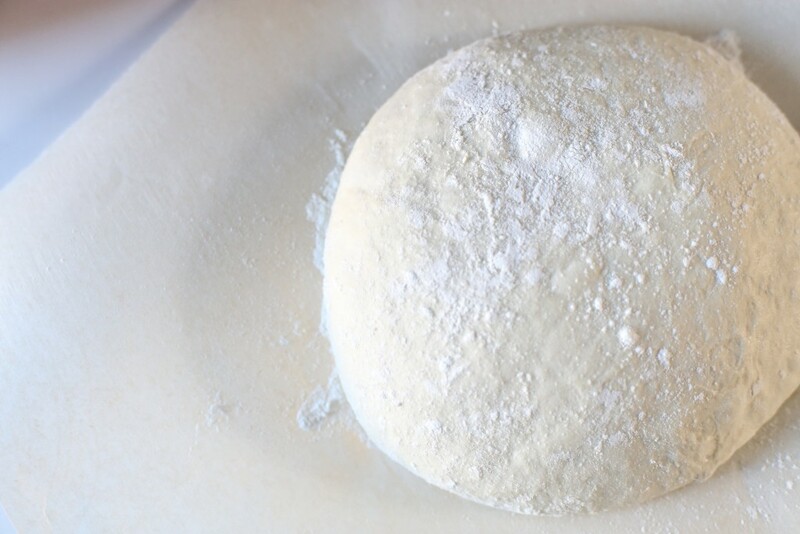 Roll out the dough into a large rectangle (I try to aim for 16″x12″ but it doesn’t need to be exact). Brush on the melted butter in order to fully coat the dough and then top with the apple cinnamon mixture trying to spread it as evenly as possible. From the long end, roll the dough into a tight cylinder and slice into individual buns (about 1 1/2″) Don’t worry if you lose a bit of filling, this step tends to be a little bit messy. I got 12 large buns out of this, cutting into about 1 1/2 inch pieces give or take. You can go smaller depending on how many rolls you want to get. In a parchment paper lined baking pan (9″x11″), evenly place the rolls leaving a bit of space between them (don’t worry, they will continue to rise and expand while cooking so that there are no gaps). Cover the pan with parchment and allow to rise for another 30 minutes before baking. Preheat the oven to 350°F and bake for about 35 minutes or until golden brown and puffed up. Keep an eye on them because the time will vary depending on your oven and the size of your rolls. 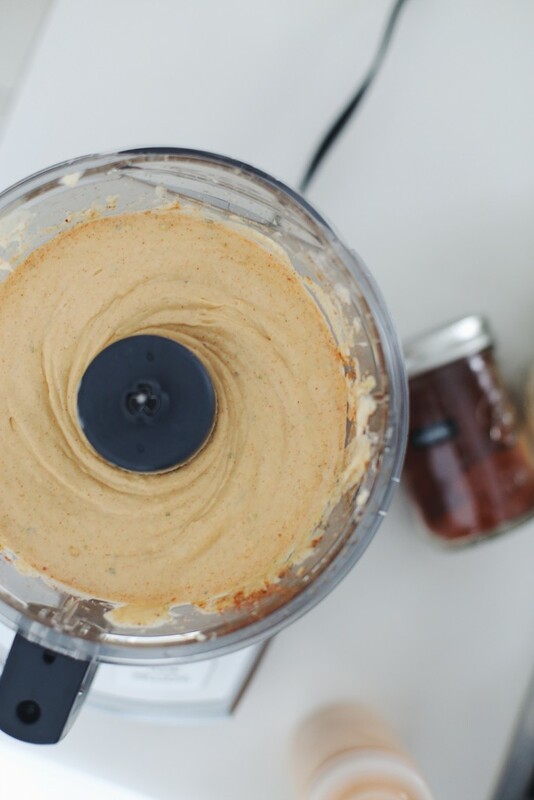 Prepare the frosting while the buns are baking by beating the cream cheese in a stand mixer with the paddle attachment. Once it is fluffy, add in the powdered sugar and continue to beat on low while slowly adding the milk along with a splash of vanilla. You can adjust the consistency by adding more milk to thin it out or more sugar to thicken it. When the buns are ready you can choose to glaze them all right in the pan, or serve the icing separately. Sure, everybody likes a nice stack of classic pancakes but this dutch pancake takes things to a different level. It’s become one of my favorite lazy Sunday brunches. It’s nice because you can easily feed 4 people at once and serve it straight from the pan. I’ve been meaning to try making it with other berries but haven’t gotten around to it yet. It would be great with raspberries, strawberries or even no berries at all. I also like to serve it with a big spoonful of greek yogurt with blueberry jam swirled through. Start by preheating your oven to 450°F as well preheating an oven safe pan (10 inch) over medium heat. Beat eggs very well until frothy. I like to use my stand mixer for this but you can use any electric mixer or do it by hand if you don’t have one. When eggs are frothy, whisk in the flour, milk, vanilla, cinnamon nutmeg and salt and continue to beat until batter is smooth. This should take about a minute. When batter is ready, melt butter in the hot pan until it is lightly browned and then pour in the batter. Quickly drop in the blueberries and try to spread them evenly. 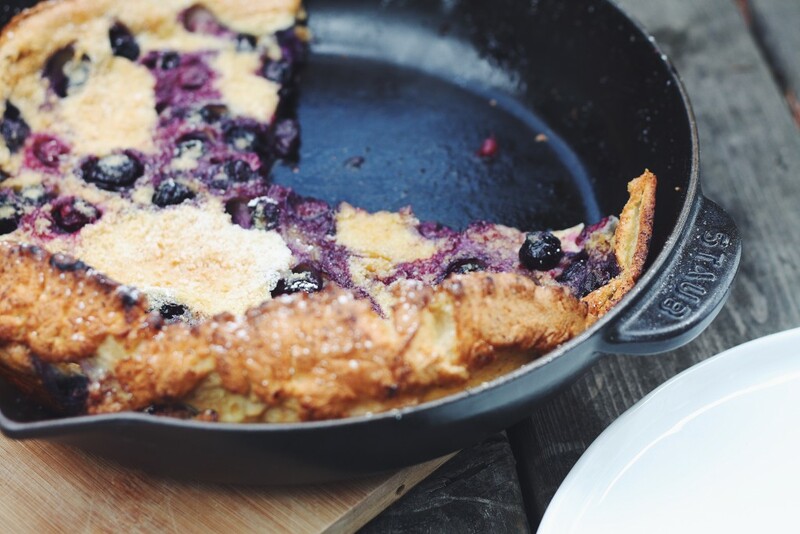 As soon as the blueberries are in, carefully transfer the skillet into the oven on middle rack. Bake for about 20 minutes or until puffed up and golden brown. If you read my last recipe on avocado tacos, you know that I’ve been working with Reynolds on their Endless Table Program focusing on summer BBQ. Check out the link to see it on Instagram and also check out their website to see many more amazing summer recipes. In my opinion, there is nothing more BBQ than a big rack of ribs. 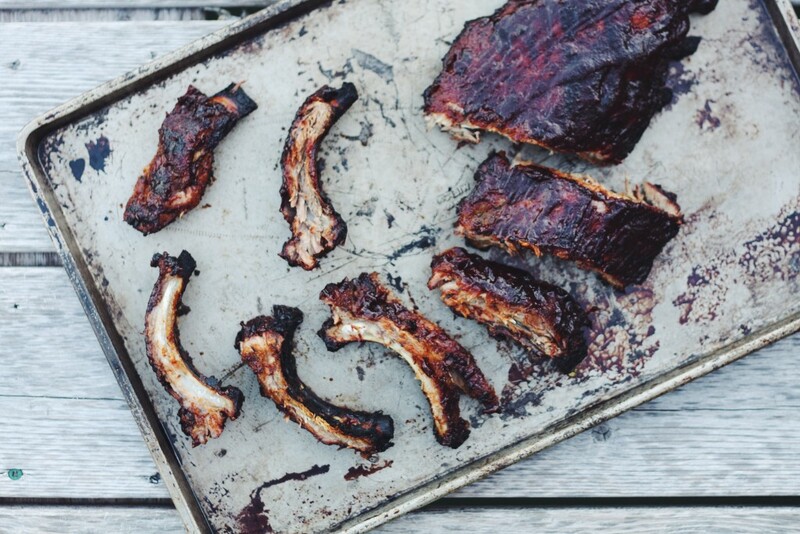 Traditionally, BBQ ribs are done low and slow in a smoker. Don’t worry if you don’t have a smoker, you can get just as good results using your oven and some aluminum foil. The key is a tight wrap in foil and a low temperature in the oven. A great BBQ sauce doesn’t hurt either. I’ve tried several different ways of making ribs at home and this method is probably my favorite. It’s also the easiest. Most of the work happens in the oven giving you plenty of time to prep the BBQ sauce and the rest of dinner. Speaking of the rest of dinner, I love to serve these ribs with a creamy red cabbage slaw. They go perfectly together. Here are a few tips I think are useful for making this recipe. One of the most important things is to ensure you have a tight seal when wrapping the ribs. You don’t want any leaks in the oven. Leaks will not only result in a dryer rib but also will be a nightmare to clean up. If you’re not sure if the seal is tight, throw an extra layer of foil on the ribs. Also, be very careful when unwrapping the ribs. The liquid inside the foil will be super hot. 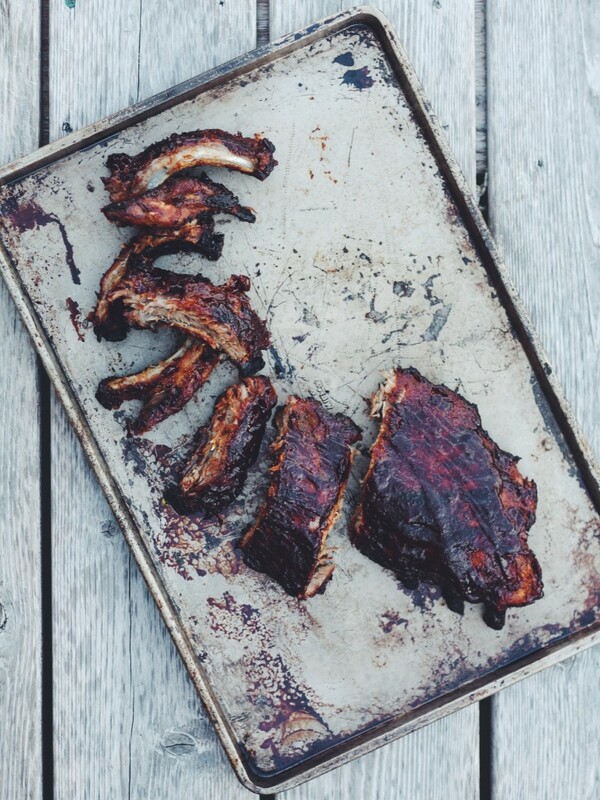 Finally, when barbecuing the ribs, don’t worry if the bottoms get a little too charred. You can’t really burn them. When creating this recipe with Reynolds, it was intended to be an appetizer with the ribs cut individually and served for sharing. You can definitely serve in bigger portions and use multiple racks though. 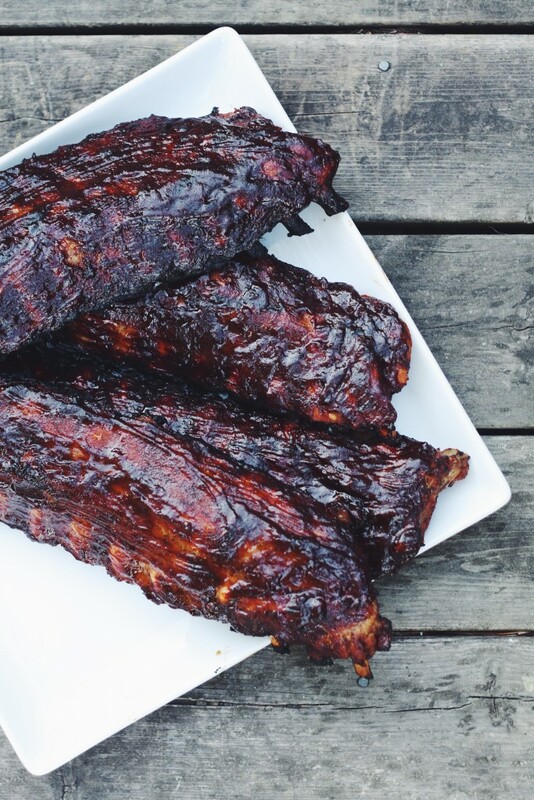 If you’ve never made ribs before, or are hesitant that you can make delicious ribs without a smoker, trust me and give these a try. 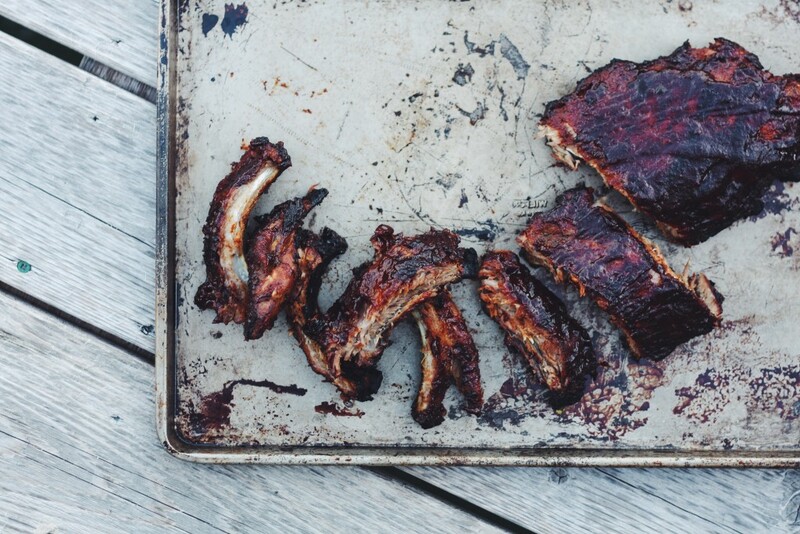 You’ll be surprised at how easy it is to make amazing ribs at home. Combine all the ingredients for the dry rub in a small bowl and mix together well. Tear a large piece of Reynolds Wrap® Aluminum Foil and place the rack of ribs on it, meat side up. Evenly coat both sides of the ribs with the dry rub, pressing it in with your hands. Fold up the sides of the foil to create a rim, and pour the apple juice in around the ribs. Fold the foil over the ribs and crimp it to create a tight seal. Tear off one more piece of large foil and wrap the whole thing again to ensure a tight seal. Place the wrapped ribs in the fridge to marinate for 2 hours. Preheat oven to 225°F and cook ribs for about 4 hours. You should be able to easily pierce them with a fork, but they shouldn’t be falling off the bone. Preheat grill to high heat. Place the cooked ribs on the grill, meat side up and brush the top with a layer of sauce. Close grill until the sauce is mostly dried, about 5 minutes. Brush another layer of sauce on top and close grill for an additional 5 minutes. Remove ribs from grill and lightly brush with one more layer of sauce. Cut the ribs into individual pieces and serve with extra sauce. Summer time is all about grilling. It’s also all about tacos. So when Reynolds asked me to help out and create a recipe for their summer BBQ Endless Table on Instagram, I knew this would be perfect. I had never grilled Avocados before but after a bit of testing, I found that they tasted pretty good. It was best to grill them halved but with the skin still on so they held together nicely. 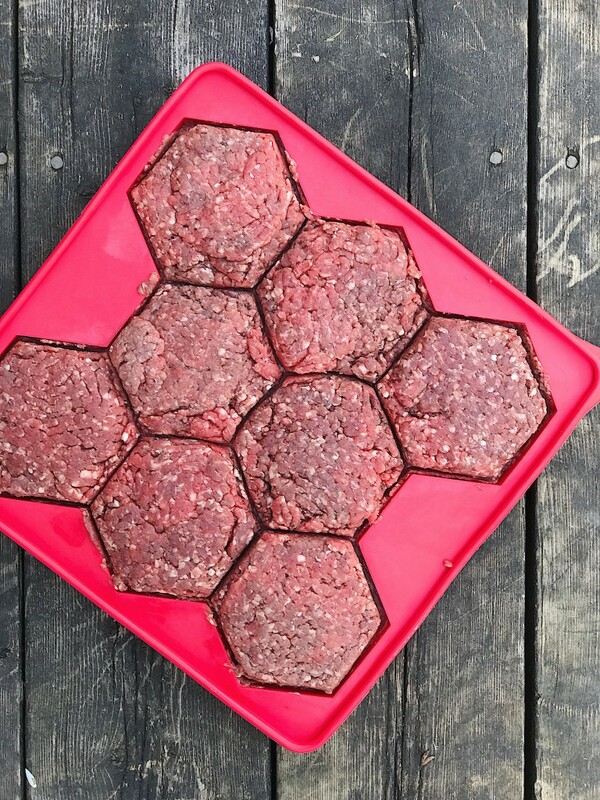 Technically you could quarter them before grilling if you wanted to grill multiple sides but I don’t think it’s necessary. If you’re thinking you won’t enjoy a taco without some sort of meat, think again. 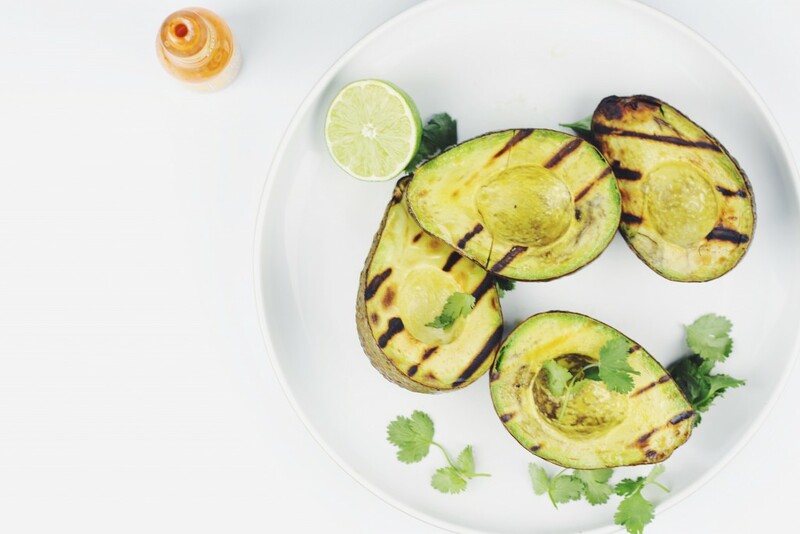 Avocados make a great taco base that’s super satisfying and almost meaty; especially when grilled. I’ve actually been meaning to try a deep fried avocado taco, which I will definitely check off the list soon. 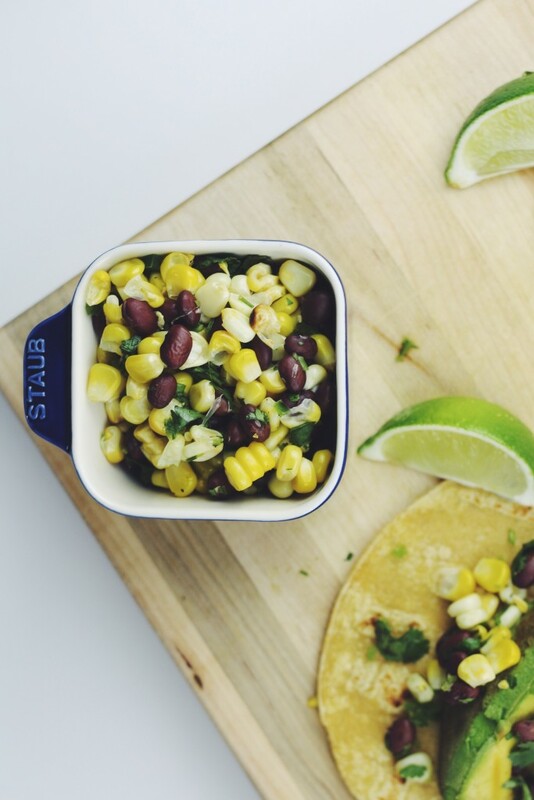 These tacos are topped with a fresh salsa made from grilled corn and black beans along with a spicy kick from jalapeño and some brightness from cilantro and lime. They’re perfect for a fun summer dinner or backyard BBQ. They also make a great option if you are vegetarian or cooking for one. It’s one of those meals that makes everybody happy. One of the easiest ways to grill corn, especially for a salsa is to just wrap it in foil and throw it on the grill. Of course you can grill it without the foil for the added char, but you’ll have to keep an eye on it as it will burn quickly. The foil method is worry free and always give great results. Same goes for the tortillas. When I make a big batch of tacos, I always just wrap up a bunch in foil and toss it on the grill. The foil even doubles as a tortilla warmer while everybody is eating. 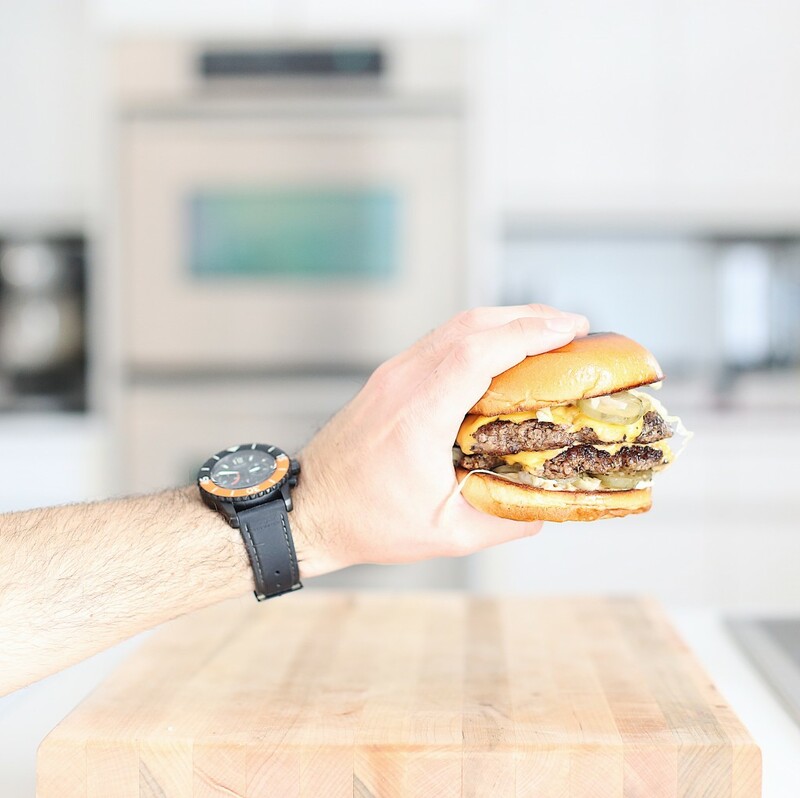 I still have one more recipe on the Endless table that I will be sharing this summer, but in the meantime, check out some other amazing recipes on the Endless Table here. For this recipe, along with all the other Endless Table recipes, Reynolds sent me some foil to utilize. I often use foil in my cooking so I am happy to incorporate it into my recipes. All opinions about it are my own. Brush corn with olive oil and individually wrap with Reynolds Wrap® Aluminum Foil. Place on the grill turning frequently for 20 minutes. Allow to cool slightly before handling. 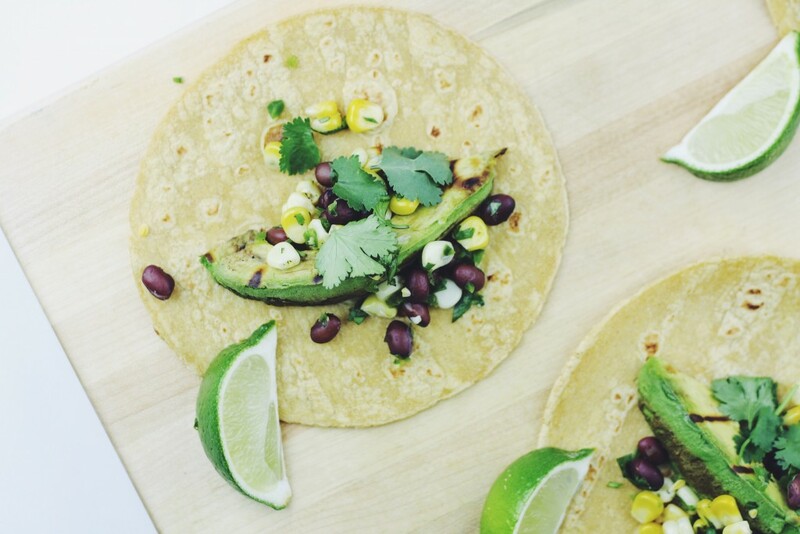 Cut corn off the cob and combine with black beans, jalapeno, cilantro and the juice of 1 lime. Season to taste with salt and pepper and set salsa aside. Slice avocados in half and remove the seeds but do not remove the skin yet. Squeeze the juice of the remaining lime over the avocados and lightly brush them with olive oil. 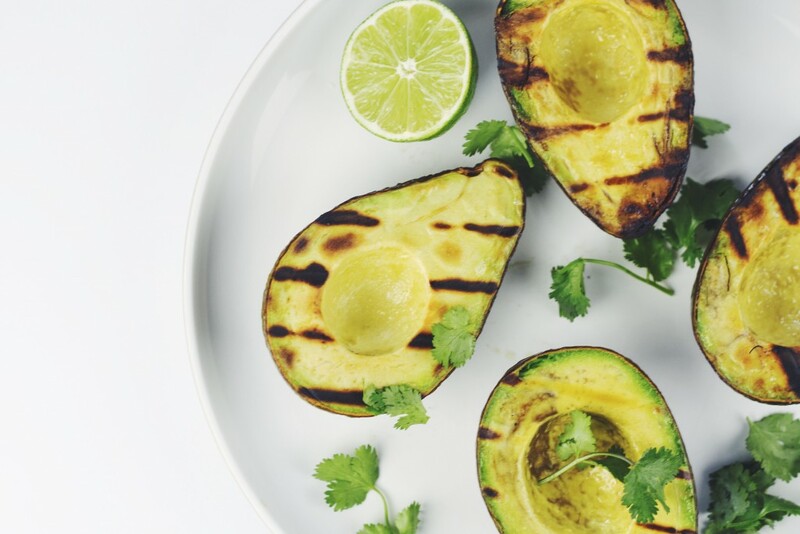 Wrap tortillas in foil and place on the grill while the avocados are cooking. 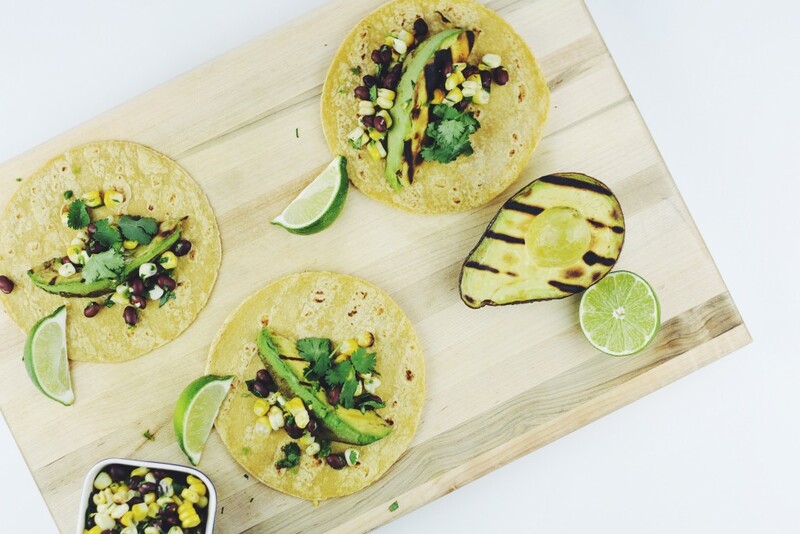 Build tacos by placing avocado slices on tortillas and then top with the corn and black bean salsa. Serve with your favorite hot sauce and additional lime wedges. 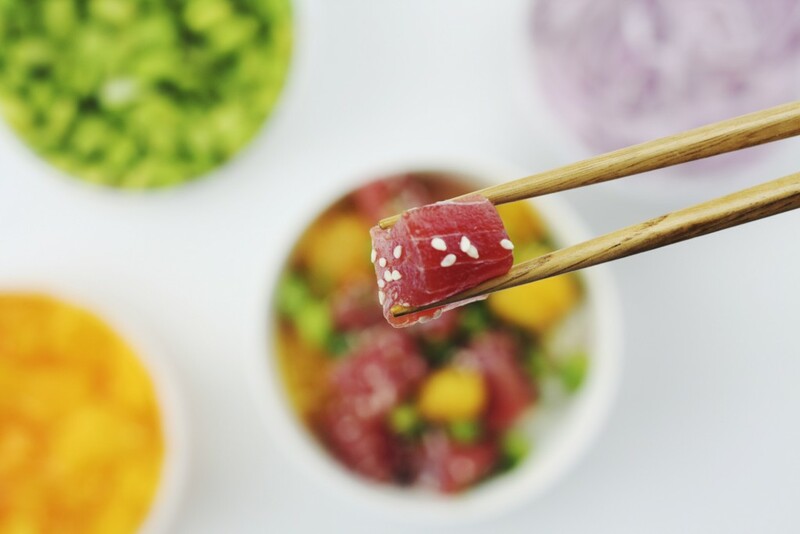 I first made poké several years ago after hearing about it on some Food Network show (probably diners, drives in, and dives). I loved raw tuna so I thought I’d give it a shot. I think I went with a pretty classic sauce which was essentially a mixture of sesame oil, soy sauce, and a bit of rice vinegar. It was good. Not great, but good. I enjoyed it but I knew it could be way better. The tuna was good, the rice was good, the toppings were good, but they didn’t all fit together. After that experience I forgot about poké and didn’t try to make it again. That was until I visited my sister in Santa Monica. 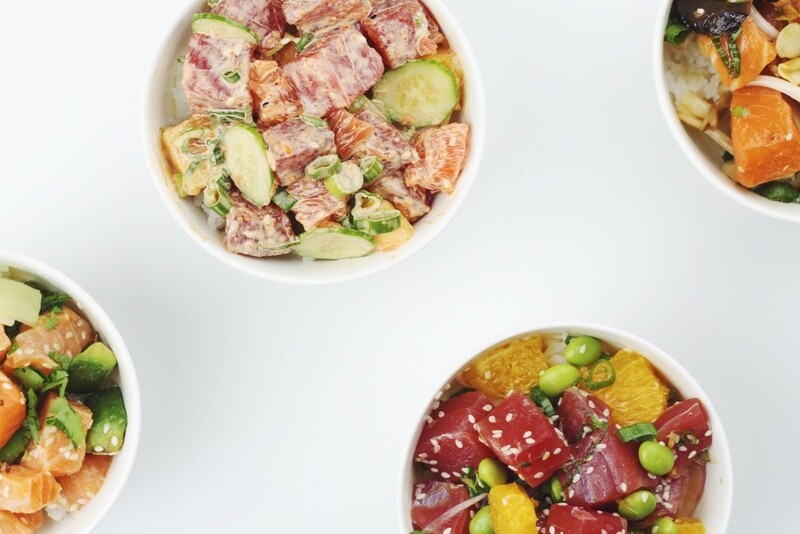 I know that Poké is a Hawaiian dish but it seems that Los Angeles is some sort of Poké hub. People literally line the streets just to wait for a bowl. So since I was there I had to get a taste of the real deal. It was a game changer. My original bowl of Poké didn’t even compare. I realized that I didn’t pre mix the bowl when I made it. It doesn’t seem like a big deal but the initial incorporation of ingredients is key. I watched how the pros did it and took my new knowledge back home. It was like black and white. 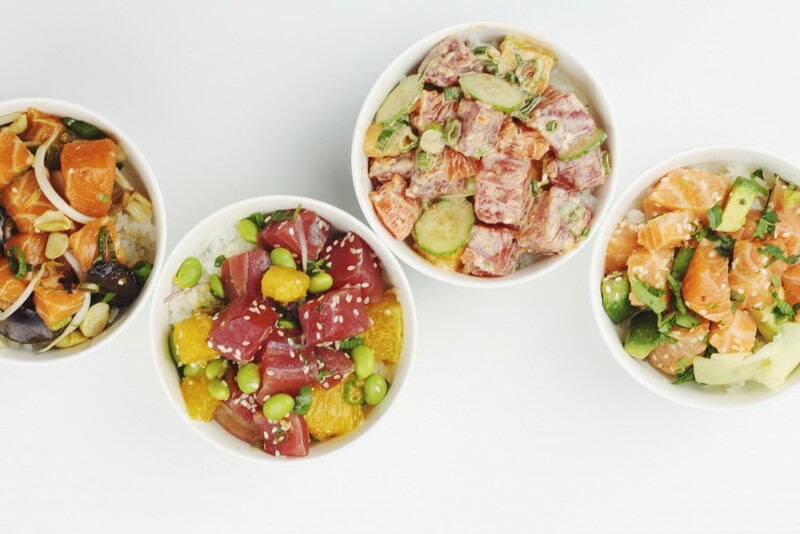 My trip to Santa Monica definitely increased my Poké skills and I was happy to see that my poké rivalled the most popular spots in LA. Think of this recipe as a guide more than anything. You don’t need to use theses specific toppings, they are just an example of a bowl I made. I recently made poké for a crowd and set up tons of different toppings. To give you an idea, I used mango, cucumber, avocado, oranges, grapefruit, kale, red onion, carrots, edamame, crispy fried onions, fried wontons, macadamia nuts, pickled ginger, and pickled shiitake mushrooms. 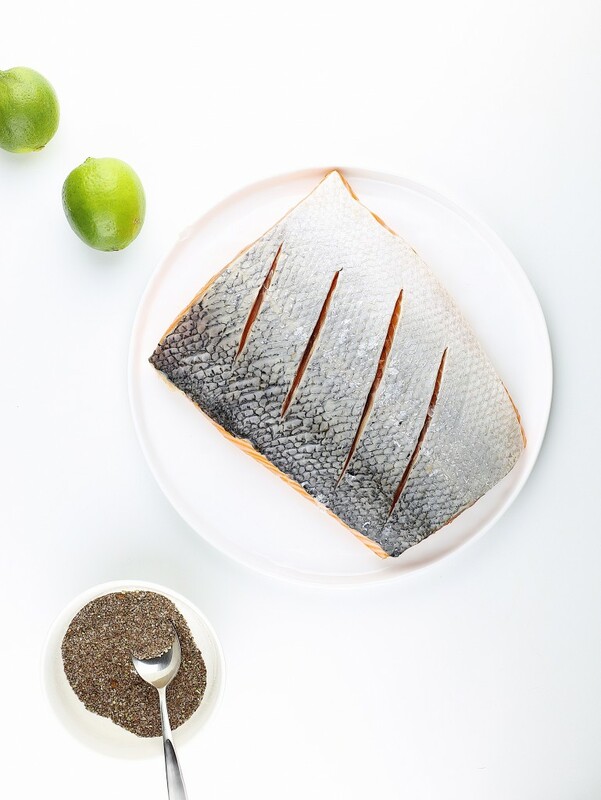 It doesn’t matter if you use tuna or salmon, just make sure you are using fresh fish. At the end of the day, the fish is the star of the show. If you don’t start with good ingredients, you won’t get a good result. It’s all about balance. I recommend a few different vegetables (or fruits), something crispy, and something pickley in each bowl. Also, as a base, always include lots of green onion and sesame seeds. *To make the chili marinated oranges, peel and dice 1 orange and marinate in 2 tsp chili oil. To make the sauce, Combine all the ingredients in a small bowl. Stir well to combine and keep in fridge until ready to build bowls. 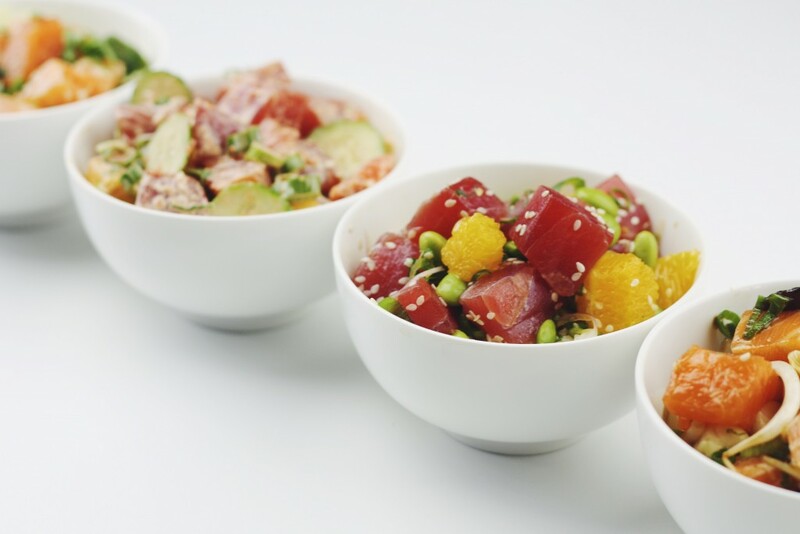 To get the bowls ready, cube all the tuna and keep cold until ready to eat. 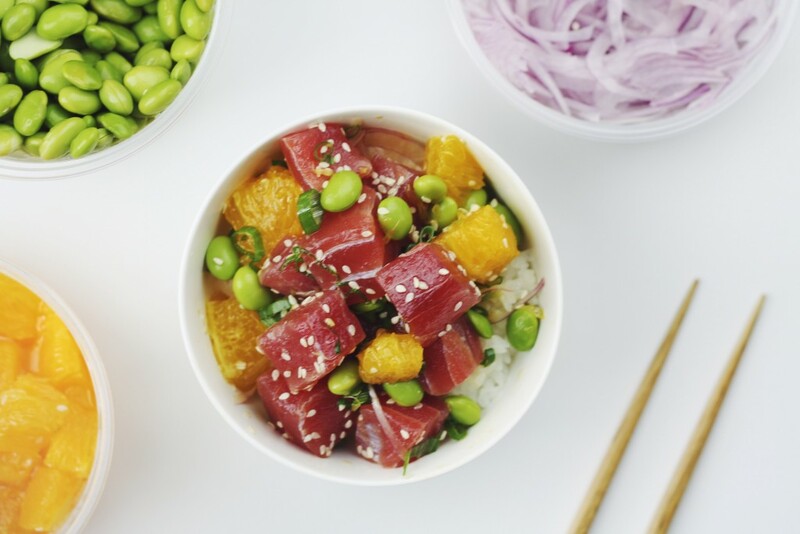 For a full portion, add about 4 oz tuna to a bowl along with the rest of your desired toppings and sauce. stir well and serve over steamed rice. 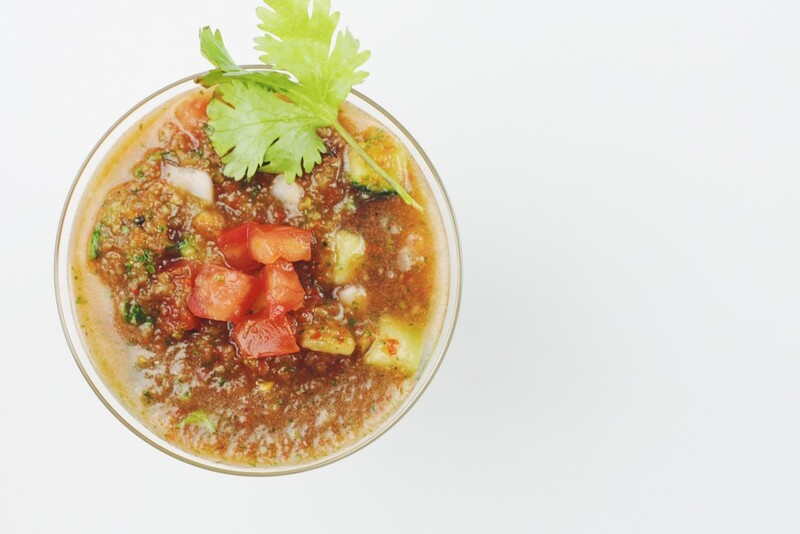 Gazpacho has got to be one of the absolute best quick and easy summer recipes. It is definitely up there as one of my favorite things to eat once the weather warms up. 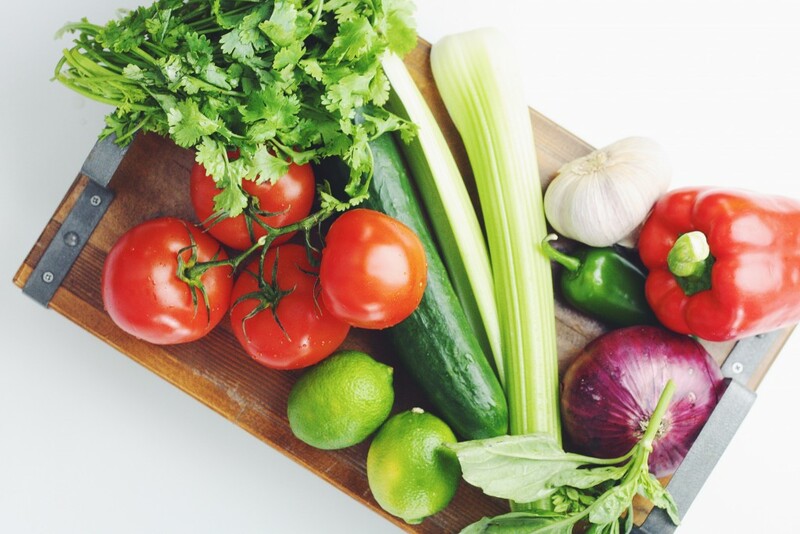 The key to a good gazpacho is to use fresh ingredients. Since there is no cooking involved, it’s a great opportunity to let the ingredients shine. 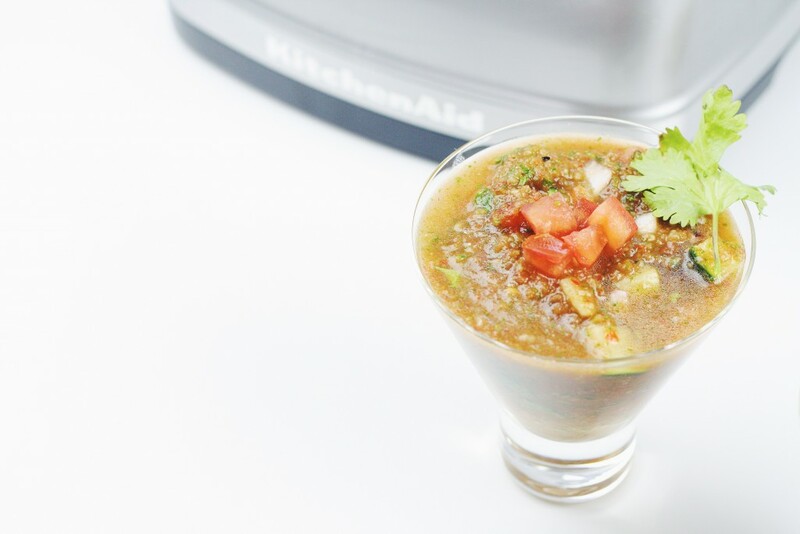 The flavors of this particular gazpacho are super bright and refreshing. 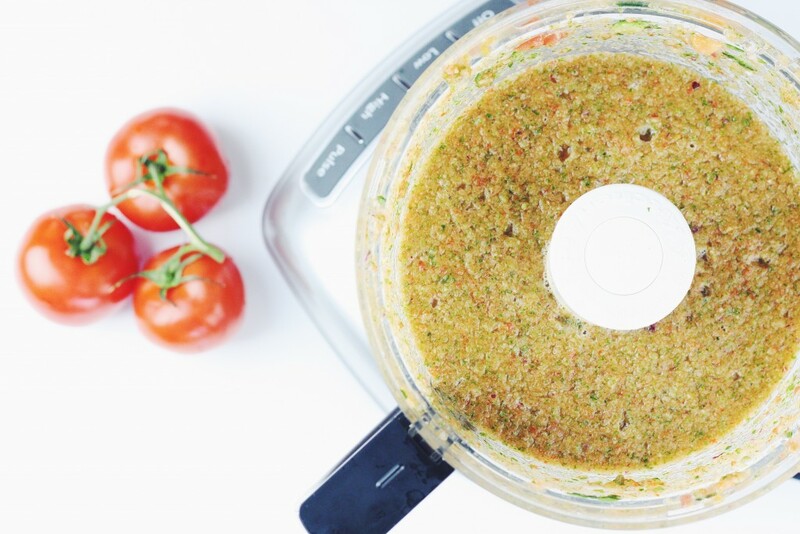 Lots of cilantro, fresh lime, red onion, and of course tomato. 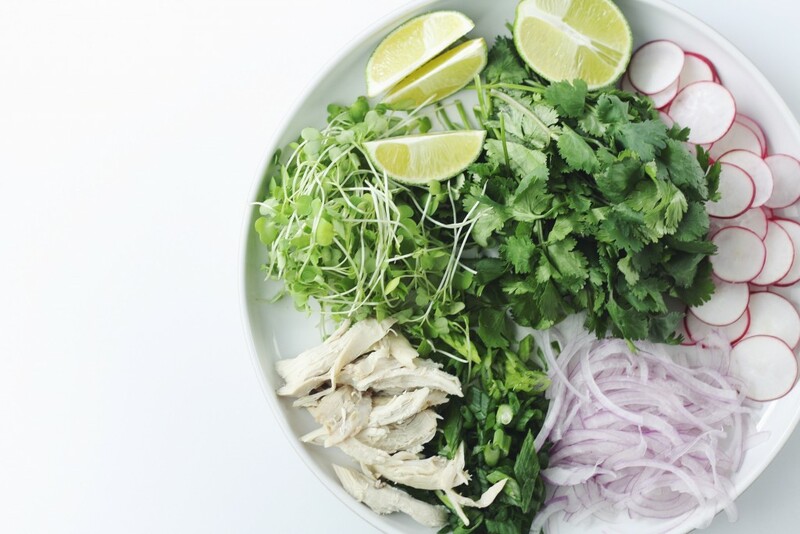 I love the freshness of cilantro and lime so I’m pretty generous with it. Part of why I like this gazpacho so much is because it kind of tastes like a drinkable Pico de Galo, which I have no problem eating by the spoonful anyway. 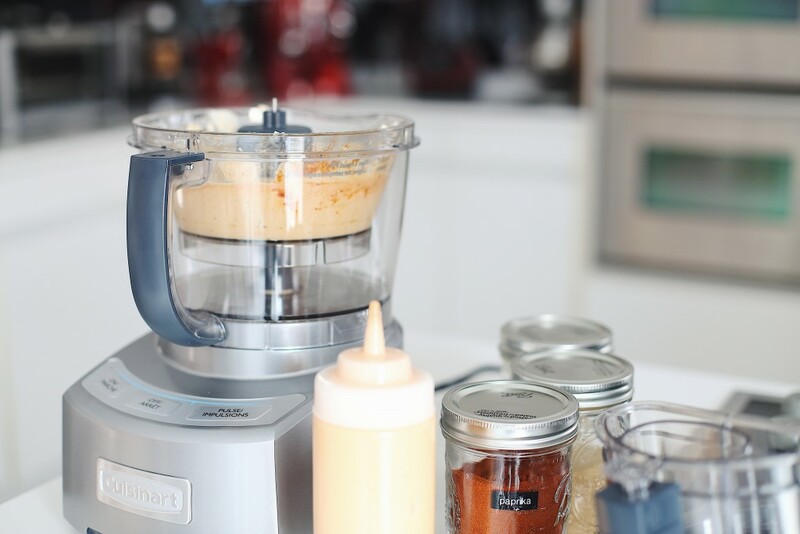 I need to disclose that KitchenAid was generous enough to provide me with one of their food processors for this recipe but I assure you, all opinions are my own. Any food processor or blender would work fine for this recipe, but I do admit, I was pleasantly surprised with the dicing feature on the food processor they sent me. I was hesitant that it would be able to evenly dice a tomato without turning it into mush but after testing it out, I was a big believer. I’ve always found dicing large quantities of tomatoes to be a bit of a pain but those days are over. I see large amounts of Pico in my future. You don’t really need to dice anything for this recipe but I like a bit of additional tomato and cucumber for garnish and a bit of added texture. If you are content without it, feel free to throw all the ingredients in and process away. It really is that easy. At the end of the day, it’s just a mixture of blended vegetables, some olive oil, and some tomato juice. Feel free to change up the recipe to your liking. There are so many ways you can easily change it up. You can add more tomato juice to thin it out, take out the jalapeño if you don’t like any heat, or use different varieties of tomatoes. The flavors of the gazpacho get better and better as it sits in the fridge so I recommend making this the day before you plan to serve it and keep it in the fridge until just before serving. If you’re tight on time don’t sweat, you can make it day of. But either way, make sure it is nicely chilled. As the soup sits in the fridge, it tends to thicken up slightly, so if necessary thin it out with a little bit of tomato juice before serving. I personally prefer it on the thicker end but that’s totally up to you. I usually make gazpacho as a snack or appetizer on a hot day but a larger bowl would definitely make for a satisfying meal. It goes really well with some grilled shrimp and you can add croutons or serve with bread to make it a bit more filling. 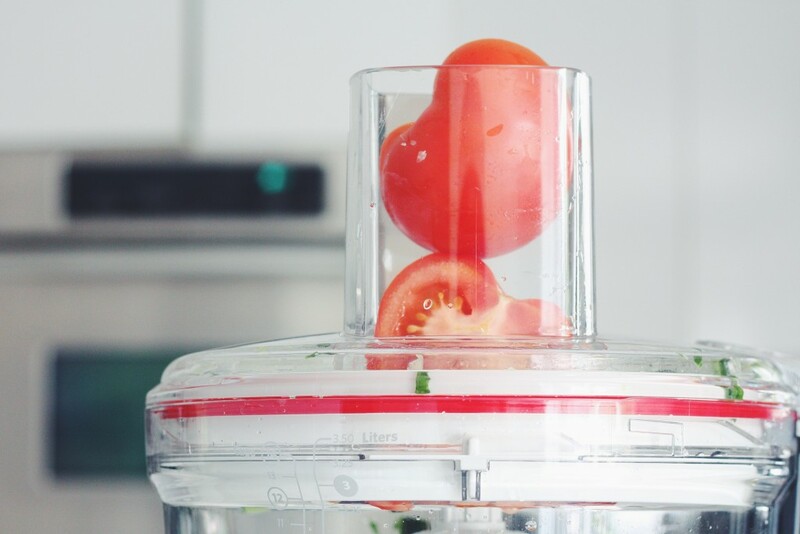 In the bowl of a food processor, add the rest of the tomatoes and cucumber along with the onion, bell pepper, celery, cilantro, basil, garlic, and garlic. 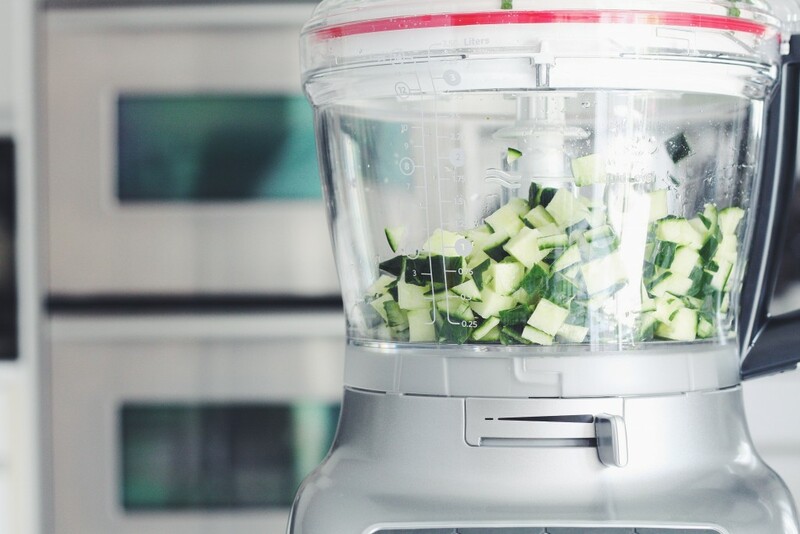 You will need to roughly cut up the vegetables so they fit into the food processor. Pulse until uniformly pureed. Add in the tomato juice, oil, vinegar, lime juice and celery salt. Pulse again until incorporated and smooth. Taste the soup and season to preference with salt, pepper, and a Tabasco. Transfer soup to fridge and chill well before serving.